Enforcing Act against Spirituous Liquors, Bill. 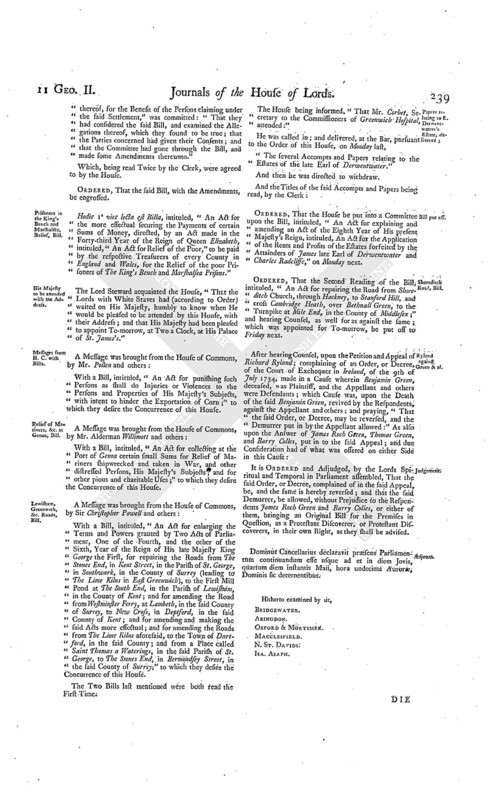 With a Bill, intituled, "An Act for enforcing the Execution of an Act made in the Ninth Year of His present Majesty's Reign, intituled, An Act for laying a Duty upon the Retailers of Spirituous Liquors, and for licensing the Retailers thereof;" to which they desire the Concurrence of this House. Gravesend, &c. Road, repairing, Bill. 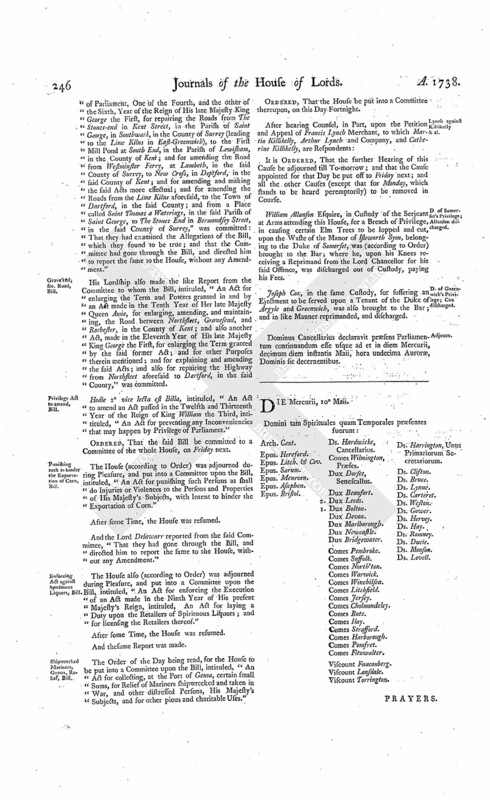 With a Bill, intituled, "An Act for enlarging the Term and Powers granted in and by an Act made in the Tenth Year of Her late Majesty Queen Anne, for enlarging, amending, and maintaining, the Road between Northfleet, Gravesend, and Rochester, in the County of Kent; and also another Act, made in the Eleventh Year of His late Majesty King George the First, for enlarging the Term granted by the said former Act; and for other Purposes therein mentioned; and for explaining and amending the said Acts; and also for repairing the Highway from Northfleet aforesaid, to Dartford, in the said County;" to which they desire the Concurrence of this House. 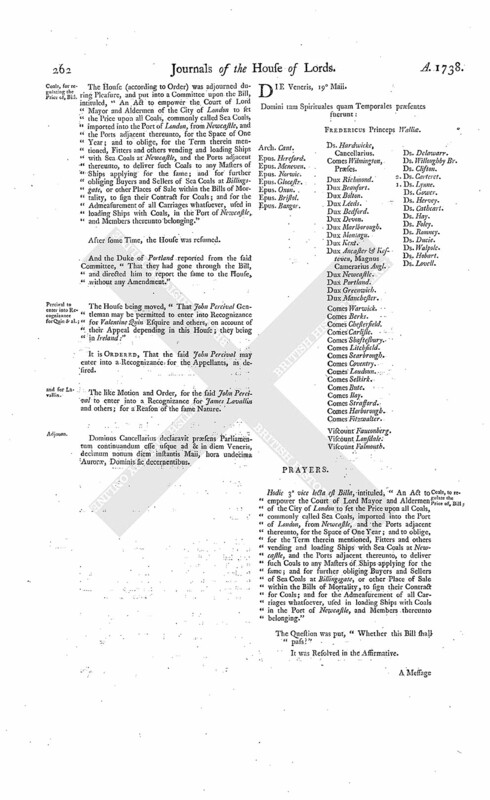 Upon reading the Petition of several Persons whose Names are thereunto subscribed, Landholders and Inhabitants of the Parish of Saint John, Hackney, on Behalf of themselves and many others; setting forth, That there is a Bill depending in this House, for repairing the Road from The Stones-end, in Shoreditch, to several Places particularly mentioned; and that, in case the same should pass, certain Impositions will be laid on the Petitioners, for which there is no Necessity, whereby they will be greatly affected in their Estates and Properties;" and praying, "That they may be heard, by their Counsel, against the said Bill:"
Counsel to be heard against it. It is Ordered, That the said Bill be read a Second Time on Thursday next; and that the Petitioners may be heard, by their Counsel, as desired, at the said Second Reading; as may Counsel also be heard for the Bill, at the same Time. The Earl of Warwick reported from the Lords Committees to whom the Bill, intituled, "An Act for enabling John Sowton to make a Lease, or Leases, of certain Messuages and Tenements, and a Wharf, therein mentioned, situate in the Parish of Saint Andrew Wardrobe, in the City of London," was committed: That they had considered the said Bill, and examined the Allegations thereof, which they found to be true; that the Parties concerned had given their Consents; and that the Committee had gone through the Bill, and directed him to report the same to the House, without any Amendment." Hodie 3a vice lecta est Billa, intituled, "An Act to enable Dorothea Clerk to sell Lands in the County of Dumfries, for Payment of Debts charged thereupon, and to purchase other Lands, to be settled to the same Uses as the Estate to be sold is settled." To carrry down the said Bill, and desire their Concurrence thereunto. This Day being appointed, for hearing Counsel, upon the Petition and Appeal of Edward Brabazon Esquire; complaining of an Order or Decree of Dismission, made and pronounced by Sir John Mead, deceased, late Chancellor of the Regalities and Liberties of the County Palatine of Tipperary, in the Kingdom of Ireland, on the 17th Day of April 1686, in a Cause wherein Edward Brabazon Esquire and Cecilia his Wife (afterwards Earl and Countess of Meath in that Kingdom) were Complainants, and Edward Lord Ward, William Ward Esquire his Son and Heir, by his Guardian the said Edward Lord Ward, John Levet Esquire and Mary his Wife, Defendants; and praying, "That the same may be reversed; and that the Appellant may be decreed to the Possession of certain Premises in Question, in the Appeal mentioned; and that William Lord Dudley and Ward may convey what Right he has at Common Law (if any) to the Appellant; or that he may have such Relief given him as this House in their great Wisdom shall think fit." The Appellant's Counsel acquainted the House, "That the Parties were come to an Agreement; and that the same was put into Writing, and consented to by the Agents on either Side, duly authorized; which they desired might be made the Order and Judgement of this House." Then the Respondent's Counsel likewise acquainting the House, "That the said Agreement was consented to on the Respondent's Part:"
And the said Agreement was again read. 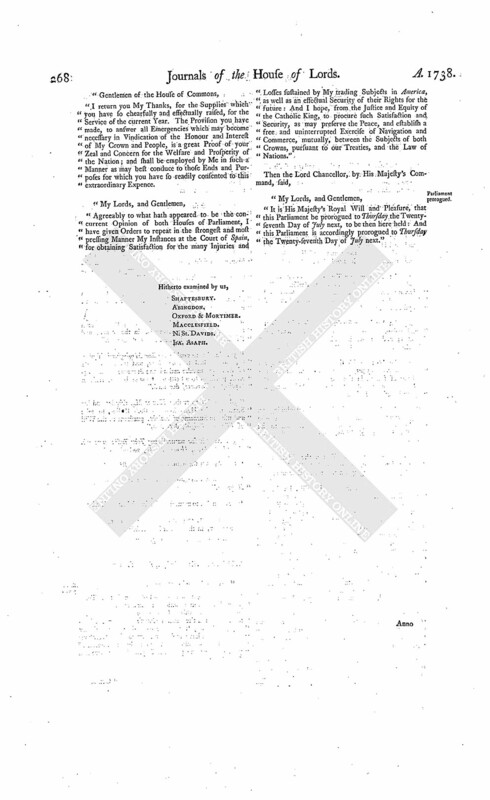 It is Ordered and Adjudged, by the Lords Spiritual and Temporal in Parliament assembled (according to the said written Agreement), That the said Order, or Decree of Dismission, complained of in the said Appeal, be, and the same is hereby, reversed: And it is hereby further Ordered, That the Premises in Question, in the Appeal mentioned, be delivered to the Appellant; and that the Respondent do convey what Right, Title, and Interest, he has, either in Law or Equity, to the Appellant; and that the Lord Chancellor of Ireland do cause an Injunction to be issued, to restore the Appellant to the Possession of the Lands whereof he was dispossessed in Pursuance of the Order of this House of the 23d Day of March 1735; and do give all such Directions as shall be necessary or proper for carrying this Order and Judgement into Execution. 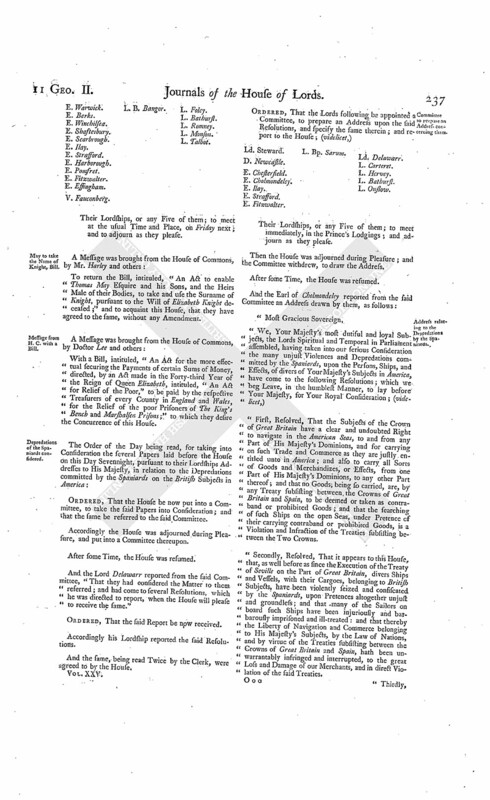 The Order of the Day being read, for the House to be in a Committee upon the Bill, intituled, "An Act for explaining and amending an Act of the Eighth Year of His present Majesty's Reign, intituled, An Act for the Application of the Rents and Profits of the Estates forfeited by the Attainders of James late Earl of Derwentwater and Charles Radcliffe." Ordered, That the proper Officer do lay before this House, the Particular of the Estates of the late Earl of Derwentwater, as they stood when the Rents and Profits thereof were appropriated to the Use of Greenwich Hospital; distinguishing each Manor and Estate, with the Rent reserved, and the Names of the Tenants who then occupied the same, and by what Tenures they were respectively held. Also, the Particular of the Estates of the late Earl of Derwentwater, as they stood at Midsummer last; distinguishing each Manor and Estate, with the Rent reserved; distinguishing what has been the advanced Rent, and the Names of the Tenants who then occupied the same, and by what Tenures they were then respectively held. Also, the Accompt of the Value of the Woods, &c. growing upon the Derwentwater Estate, as surveyed and valued in the Months of August, September, October, and November, 1737; with the Amount of the same, and the Quantity of Acres of Wood Land, distinguishing each Estate. Also, the Accompt of what Mortgages or Encumbrances are charged on the Estates of the late Earl of Derwentwater; distinguishing what Parts are affected by each Encumbrance, and the Nature and Value of the said Estates. Also, the Accompt of the Particulars of the Lands, Part of the Estate of the late Earl of Derwentwater, proposed to be sold instead of the Lands mortgaged; with the Nature and Value of the said Estates, and the Names of the Persons whose Estates they lie intermixed with. Also, the Account of the Names of the respective Lordships and Lands belonging to the Estates of the late Earl of Derwentwater, in which Lead, Coal, or other Minerals, are, or are supposed to be; distinguishing what Mineral is, or is supposed to be, in each of the Premises. Also, the Account shewing which of the Manors and Lands belonging to the Estates of the late Earl of Derwentwater are open, and which enclosed; and the Account of the Quantity of Waste Ground belonging to each. Also, Copies of the several Proposals which have been made to the Commissioners of Greenwich Hospital, or their Agents, for the Working of Mines upon the Estates of the late Earl of Derwentwater; as also the Account which of them have been accepted, and what Proceedings have been had to carry the same into Execution. And likewise, a Copy or Copies of any Lease, or Leases, of some of the Mines in the said Estates, since the same have been applied to the Use of Greenwich Hospital. Hodie 3a vice lecta est Billa, intituled, "An Act for the more effectual securing the Payment of Rents, and preventing Frauds by Tenants." Dominus Cancellarius declaravit præsens Parliamentum continuandum esse usque ad & in diem Martis, secundum diem instantis Maii, hora undecima Auroræ, Dominis sic decernentibus. With a Bill, intituled, "An Act for granting to His Majesty the Sum of Two Millions, for the Service of the Year One Thousand Seven Hundred and Thirtyeight; and for paying to the Governor and Company of the Bank of England One Million, for redeeming an Annuity of Forty Thousand Pounds, payable to them; and for the further appropriating the Supplies granted in this Session of Parliament;" to which they desire the Concurrence of this House. Hodie 3a vice lecta est Billa, intituled, "An Act for enabling John Sowton to make a Lease, or Leases, of certain Messuages and Tenements, and a Wharf, therein mentioned, situate in the Parish of Saint Andrew Wardrobe, in the City of London." Hodie 2a vice lecta est Billa, intituled, "An Act for enlarging the Term and Powers granted in and by an Act made in the Tenth Year of Her late Majesty Queen Anne, for enlarging, amending, and maintaining, the Road between Northfleet, Gravesend, and Rochester, in the County of Kent; and also another Act, made in the Eleventh Year of His late Majesty King George the First, for enlarging the Term granted by the said former Act, and for other Purposes therein mentioned; and for explaining and amending the said Acts; and also for repairing the Highway from Northfleet aforesaid to Dartford, in the said County." 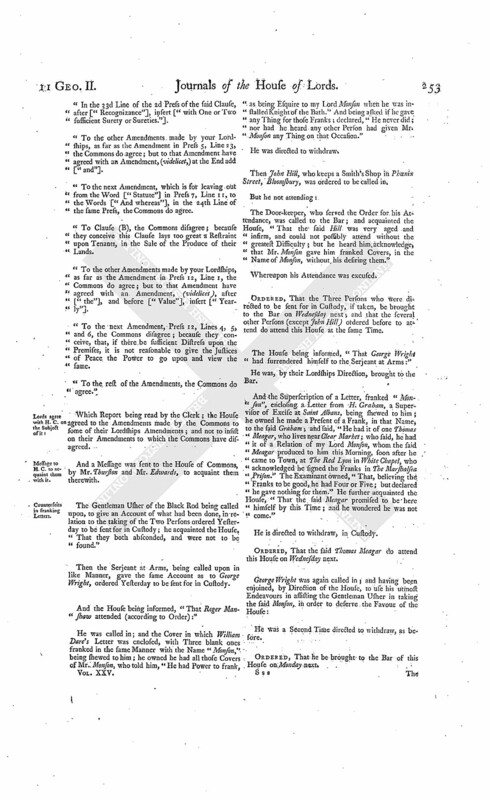 To return the Bill, intituled, "An Act to enable Thomas May Esquire and his Sons, and the Heirs Male of their Bodies, to take and use the Surname of Knight, pursuant to the Will of Elizabeth Knight deceased;" and to acquaint this House, that they have agreed to the same, without any Amendment. With a Bill, intituled, "An Act for the more effectual securing the Payments of certain Sums of Money, directed, by an Act made in the Forty-third Year of the Reign of Queen Elizabeth, intituled, "An Act for Relief of the Poor," to be paid by the respective Treasurers of every County in England and Wales, for the Relief of the poor Prisoners of The King's Bench and Marshalsea Prisons;" to which they desire the Concurrence of this House. Depredations of the Spaniards considered. Ordered, That the House be now put into a Committee, to take the said Papers into Consideration; and that the same be referred to the said Committee. And the Lord Delawarr reported from the said Committee, "That they had considered the Matter to them referred; and had come to several Resolutions, which he was directed to report, when the House will please to receive the same." Accordingly his Lordship reported the said Resolutions. Committee to prepare an Address concerning them. E. Fitzwalter. L. Bp. Sarum. Ld. Delawarr. Their Lordships, or any Five of them; to meet immediately, in the Prince's Lodgings; and adjourn as they please. Then the House was adjourned during Pleasure; and the Committee withdrew, to draw the Address. Address relating to the Depredations by the Spaniards. "First, Resolved, That the Subjects of the Crown of Great Britain have a clear and undoubted Right to navigate in the American Seas, to and from any Part of His Majesty's Dominions, and for carrying on such Trade and Commerce as they are justly entitled unto in America; and also to carry all Sorts of Goods and Merchandizes, or Effects, from one Part of His Majesty's Dominions, to any other Part thereof; and that no Goods; being so carried, are, by any Treaty subsiting between, the Crowns of Great Britain and Spain, to be deemed or taken as contraband or prohibited Goods; and that the searching of such Ships on the open Seas, under Pretence of their carrying contraband or prohibited Goods, is a Violation and Infraction of the Treaties subsisting between the Two Crowns. "Secondly, Resolved, That it appears to this House, that, as well before as since the Execution of the Treaty of Seville on the Part of Great Britain, divers Ships and Vessels, with their Cargoes, belonging to British Subjects, have been violently seized and confiscated by the Spaniards, upon Pretences altogether unjust and groundless; and that many of the Sailors on board such Ships have been injuriously and barbarously imprisoned and ill-treated: and that thereby the Liberty of Navigation and Commerce belonging to His Majesty's Subjects, by the Law of Nations, and by virtue of the Treaties subsisting between the Crowns of Great Britain and Spain, hath been unwarrantably infringed and interrupted, to the great Loss and Damage of our Merchants, and in direct Violation of the said Treaties. "Thirdly, Resolved, That it appears to this House, that frequent Applications have been made, on the Part of His Majesty, to the Court of Spain, in a Manner the most agreeable to Treaties, and to the Peace and Friendship subsisting between the Two Crowns, for redressing the notorious Abuses and Grievances before mentioned, and preventing the like for the future, and for obtaining adequate Satisfaction to His injured Subjects; which, in the Event, have proved entirely fruitless, and of no Effect. "We think it our Duty, on this important Occasion, humbly to represent to Your Majesty, that we are most sensibly affected with the many and grievous Injuries and Losses sustained by Your Majesty's trading Subjects, by means of these unwarrantable Depredations and Seizures; and to give Your Majesty the strongest and most sincere Assurances, that, in case Your friendly and powerful Instances for procuring Restitution and Reparation to Your injured Subjects, and for the future Security of their Trade and Navigation, shall fail of having their due Effect and Insluence on the Court of Spain, and shall not be able to obtain that real Satisfaction and Security which Your Majesty may in Justice expect, we will zealously and chearfully concur in all such Measures as shall become necessary, for the Support of Your Majesty's Honour, the Preservation of our Navigation and Commerce, and the common Good of these Kingdoms." Dominus Cancellarius declaravit præsens Parliamentum continuandum esse usque ad & in diem Mercurii, tertium diem instantis Maii, hora undecima Auroræ, Dominis sic decernentibus. Dormer's Writ of Error to be heard peremptorily. A Petition of John Dormer Esquire, was presented, and read; praying, "In regard he is apprehensive his Writ of Error, to which John Parkhurst Esquire and others are Defendants, will not come on to be argued this Session, as the Cause stands in the ordinary Course; that a Bye-day may be appointed, for hearing the same." Ordered, That the said Cause do stand to be heard peremptorily on Monday the 15th of this Instant May, being the Time it at present stands appointed. The Earl of Warwick reported from the Lords Committees to whom the Bill, intituled, "An Act for vesting certain Mills, Lands, and Hereditaments, in the Parishes of Ware and Great Amwell, in the County of Hertford, being Part of the Estate of Thomas Plummer Byde Esquire, an Infant, and comprized in his Grandfather's Marriage Settlement, in the Governor and Company of The New River, brought from Chadwell and Amwell to London, and their Successors; and for securing a perpetual Rent Charge in Lieu thereof, for the Benefit of the Persons claiming under the said Settlement," was committed: "That they had considered the said Bill, and examined the Allegations thereof, which they found to be true; that the Parties concerned had given their Consents; and that the Committee had gone through the Bill, and made some Amendments thereunto." Prisoners in the King's Bench and Marshalsea, Relief, Bill. Hodie 1a vice lecta est Billa, intituled, "An Act for the more effectual securing the Payments of certain Sums of Money, directed, by an Act made in the Forty-third Year of the Reign of Queen Elizabeth, intituled, "An Act for Relief of the Poor," to be paid by the respective Treasurers of every County in England and Wales, for the Relief of the poor Prisoners of The King's Bench and Marshalsea Prisons." The Lord Steward acquainted the House, "That the Lords with White Staves had (according to Order) waited on His Majesty, humbly to know when He would be pleased to be attended by this House, with their Address; and that His Majesty had been pleased to appoint To-morrow, at Two a Clock, at His Palace of St. James's." With a Bill, intituled, "An Act for punishing such Persons as shall do Injuries or Violences to the Persons and Properties of His Majesty's Subjects, with intent to hinder the Exportation of Corn;" to which they desire the Concurrence of this House. Relief of Mariners, &c. at Genoa, Bill. With a Bill, intituled, "An Act for collecting at the Port of Genoa certain small Sums for Relief of Mariners shipwrecked and taken in War, and other distressed Persons, His Majesty's Subjects; and for other pious and charitable Uses;" to which they desire the Concurrence of this House. Lewisham, Greenwich, &c. Roads, Bill. With a Bill, intituled, "An Act for enlarging the Terms and Powers granted by Two Acts of Parliament, One of the Fourth, and the other of the Sixth, Year of the Reign of His late Majesty King George the First, for repairing the Roads from The Stones End, in Kent Street, in the Parish of St. George, in Southwark, in the County of Surrey (leading to The Lime Kilns in East Greenwich), to the First Mill Pond at The South End, in the Parish of Lewisham, in the County of Kent; and for amending the Road from Westminster Ferry, at Lambeth, in the said County of Surrey, to New Cross, in Deptford, in the said County of Kent; and for amending and making the said Acts more effectual; and for amending the Roads from The Lime Kilns aforesaid, to the Town of Dartford, in the said County; and from a Place called Saint Thomas a Waterings, in the said Parish of St. George, to The Stones End, in Bermondsey Street, in the said County of Surrey;" to which they desire the Concurrence of this House. The Two Bills last mentioned were both read the First Time. The House being informed, "That Mr. Corbet, Secretary to the Commissioners of Greenwich Hospital, attended:"
He was called in; and delivered, at the Bar, pursuant to the Order of this House, on Monday last. "The several Accompts and Papers relating to the Estates of the late Earl of Derwentwater." Ordered, That the House be put into a Committee upon the Bill, intituled, "An Act for explaining and amending an Act of the Eighth Year of His present Majesty's Reign, intituled, "An Act for the Application of the Rents and Profits of the Estates forfeited by the Attainders of James late Earl of Derwentwater and Charles Radcliffe," on Monday next. 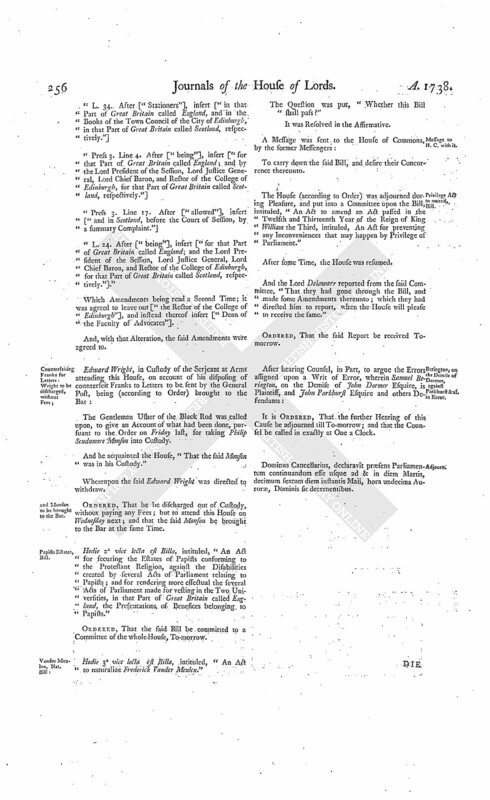 Ordered, That the Second Reading of the Bill, intituled, "An Act for repairing the Road from Shoreditch Church, through Hackney, to Stanford Hill, and cross Cambridge Heath, over Bethnall Green, to the Turnpike at Mile End, in the County of Middlesex;" and hearing Counsel, as well for as against the same; which was appointed for To-morrow, be put off to Friday next. It is Ordered and Adjudged, by the Lords Spiritual and Temporal in Parliament assembled, That the said Order, or Decree, complained of in the said Appeal, be, and the same is hereby reversed; and that the said Demurrer, be allowed, without Prejudice to the Respondents James Roch Green and Barry Colles, or either of them, bringing an Original Bill for the Premises in Question, as a Protestant Discoverer, or Protestant Discoverers, in their own Right, as they shall be advised. Dominus Cancellarius declaravit præsens Parliamentum continuandum esse usque ad et in diem Jovis, quartum diem instantis Maii, hora undecima Auroræ, Dominis sic decernentibus. Hodie 3a vice lecta est Billa, intituled, "An Act for vesting certain Mills, Lands, and Hereditaments, in the Parishes of Ware and Great Amwell, in the County of Hertford (being Part of the Estate of Thomas Plummer Byde Esquire, and Infant, and comprized in his Grandfather's Marriage Settlement) in the Governor and Company of The New River, brought from Chadwell and Amwell to London, and their Successors; and for securing a perpetual Rent Charge in Lieu thereof, for the Benefit of the Persons claiming under the said Settlement." Christ Church, Middlesex, Nightly Watch, Bill. 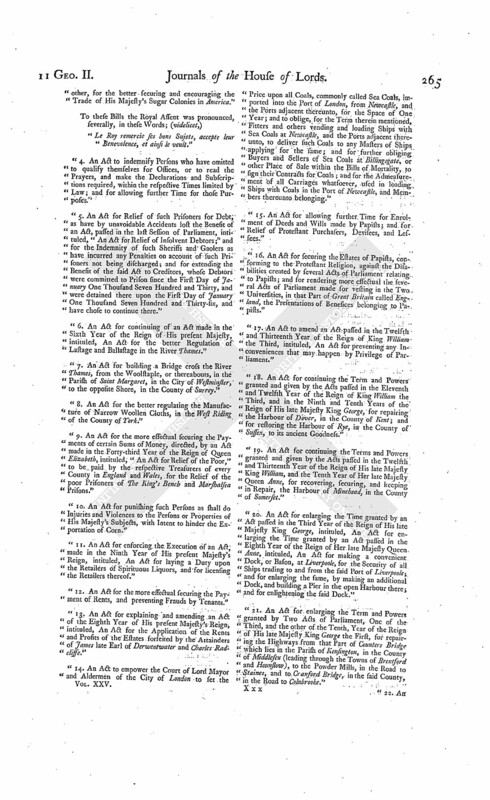 With a Bill, intituled, "An Act for the better enlightening the open Places, Streets, Lanes, Passages, and Courts, and for the better regulating the Nightly Watch and Beadles, within the Parish of Christ Church, in the County of Middlesex;" to which they desire the Concurrence of this House. With a Bill, intituled, "An Act to enable the Adventurers, Owners, and Proprietors, of the Taxable Lands, and the Owners and Proprietors of the Free Lands in Deepings Fenns, and other Fens, in the County of Lincoln, therein mentioned, to raise a competent Sum of Money, for the effectual Draining and future Preservation of all the said Fens, according to their Agreement in that Behalf; and to carry the said Agreement into Execution;" to which they desire the Concurrence of this House. Relief of Prisoners in the King's Bench and Marshalsea, Bill. Hodie 2a vice lecta est Billa, intituled, "An Act for the more effectual securing the Payments of certain Sums of Money, directed by an Act made in the Forty-third Year of the Reign of Queen Elizabeth, intituled, An Act for the Relief of the Poor, to be paid by the respective Treasurers of every County in England and Wales, for the Relief of the poor Prisoners of The King's Bench and Marshalsea Prisons." Greenwich, Lewisham, &c. Roads, Bill. Hodie 2a vice lecta est Billa, intituled, "An Act for enlarging the Terms and Powers granted by Two Acts of Parliament, One of the Fourth, and the other of the Sixth, Year of the Reign of His late Majesty King George the First, for repairing the Roads from The Stones End, in Kent Street, in the Parish of Saint George, in Southwark, in the County of Surrey (leading to The Lime Kilns in East Greenwich) to the First Mill Pond at South End, in the Parish of Lewisham, in the County of Kent; and for amending the Road from Westminster Ferry, at Lambeth, in the said County of Surrey, to New Cross, in Deptford, in the said County of Kent; and for amending and making the said Acts more effectual; and for amending the Roads from The Lime Kilns aforesaid, to the Town of Dartford, in the said County; and from a Place called Saint Thomas a Waterings, in the said Parish of Saint George, to The Stones End, in Bermondsey Street, in the said County of Surrey." E. Ilay. L. Bp. Rochester. L. Bp. Bangor. L. Romney. Their Lordships, or any Five of them; to meet at the usual Time and Place, on Tuesday next, and to adjourn as they please. Ordered, That the Committee appointed to consider of the Bill for amending certain Acts, relating to the Repair of the Roads between Northfleet, Gravesend, and Rochester, which is directed to meet To-morrow, do meet at the usual Place on Tuesday next. Punishing such as hinder the Exportation of Corn, Bill. Hodie [...]a vice lecta est Billa, intituled, "An Act for punishing such Persons as shall do Injuries or Violences to the Persons and Properties of His Majesty's Subjects, with intent to hinder the Exportation of Corn." Hodie 2a vice lecta est Billa, intituled, "An Act for granting to His Majesty the Sum of Two Millions, for the Service of the Year One Thousand Seven Hundred and Thirty-eight; and for paying to the Governor and Company of the Bank of England One Million, for redeeming an Annuity of Forty Thousand Pounds, payable to them; and for the further appropriating the Supplies granted in this Session of Parliament." Witnesses to attend Shoreditch Road Bill. Ordered, That Thomas Pedley, James Payton, and Thomas Mills, Collectors of the Land Tax for the Parish of Shoreditch, do attend this House To-morrow, with their Books of Assessments. Ordered also, That Christopher Pratt and Oswald Shaw, Collectors of the Land Tax for Bethnell Green, do attend this House To-morrow, with their Books of Assessments. Ordered likewise, That Benjamin Coker Senior, Abraham Banks, and Andrew Barber, do attend this House To-morrow, when the Bill for amending the Roads to Hackney is ordered to be read a Second Time. Administration of Assets of Insolvent Persons, Bill. 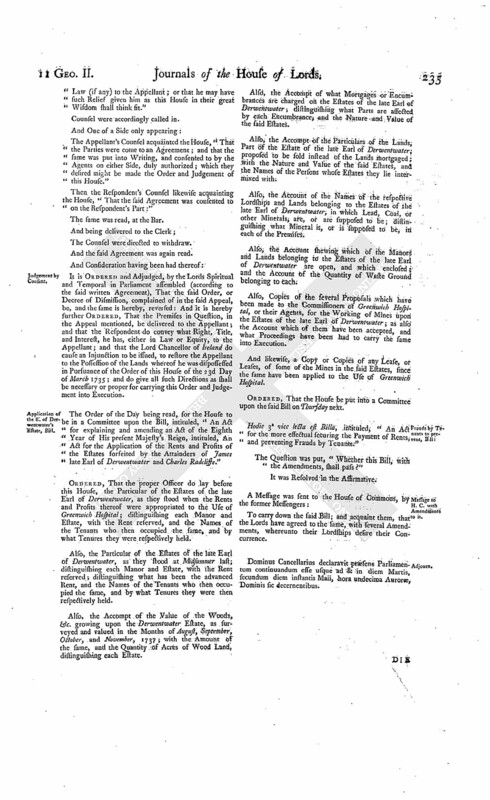 The Lord Chief Justice of the Court of King's Bench presented to the House (pursuant to their Lordships Order of the 9th of June last) a Bill, intituled, "An Act for the Amendment of the Law relating to the Administration of the Assets of Persons dying insolvent; and for an equitable Division thereof amongst their Creditors. Upon reading the Petition of Mary Aylmer Widow; setting forth, "That, in her Appeal formerly exhibited to this House, she omitted to complain of a very material Order, which the Lord Chancellor of Ireland made to her Prejudice, which, she is advised, is against Law, but cannot be relieved, by reason the same is not therein complained of; expressing her Unwillingness to give the House any unnecessary Trouble;" and praying, "That the Petitioner may have Leave to withdraw her said Appeal, she submitting to pay the Respondent William Alcock Esquire such reasonable Costs as to their Lordships shall seem meet; and that the several Orders appealed from may be affirmed:"
It is Ordered and Adjudged, by the Lords Spiritual and Temporal in Parliament assembled, That the said Petition and Appeal be, and is hereby, dismissed this House; and that the several Orders of the Court of Chancery in Ireland therein complained of be, and the same are hereby, affirmed: And it is further Ordered, That the Appellant do pay, or cause to be paid, to the said Respondent, the Sum of One Hundred Pounds, for his Costs in respect of the said Appeal. Dominus Cancellarius declaravit præsens Parliamentum continuandum esse usque ad et in diem Veneris, quintum diem instantis Maii, hora undecima Auroræ, Dominis sic decernentibus. The King's Answer to Address about Depredations by the Spaniards. "I am sensibly touched with the many Hardships and Injuries sustained by My Trading Subjects in America, from the Cruelties and unjust Depredations of the Spaniards. You may be assured of My Care to procure Satisfaction and Reparation for the Losses they have already suffered, and Security for the Freedom of Navigation for the future; and to maintain to My People the full Enjoyment of all the Rights to which they are entitled by Treaty and the Law of Nations. I doubt not but I shall have your Concurrence, for the Support of such Measures as may be necessary for that Purpose." Message from H. C. to return Naish's Bill. To return the Bill, intituled, "An Act for vesting the Real and Personal Estate of Hugh Naish Esquire (who was late a Prisoner in His Majesty's Prison of The Fleet, and escaped out of the same) in Trustees, for the Benefit of his Creditors;" and to acquaint this House, that they have agreed to their Lordships Amendments made thereto. With a Bill, intituled, "An Act to explain and amend an Act passed in the Eighth Year of His present Majesty's Reign, intituled, An Act for rebuilding the Parish Church of St. Leonard, Shoreditch, in the County of Middlesex;" to which they desire the Concurrence of this House. Against importing Books reprinted Abroad, Bill. With a Bill, intituled, "An Act for prohibiting the Importation of Books re-printed Abroad, that were originally printed in Great Britain; and for limiting the Prices of Books;" to which they desire the Concurrence of this House. Shipwrecked Mariners, at Genoa, Relief, Bill. Hodie 2a vice lecta est Billa, intituled, "An Act for collecting, at the Port of Genoa, certain small Sums, for Relief of Mariners shipwrecked and taken in War, and other distressed Persons, His Majesty's Subjects; and for other pious and charitable Uses." Hodie 1a vice lecta est Billa, intituled, "An Act to enable the Adventurers, Owners, and Proprietors, of the Taxable Lands, and the Owners and Proprietors of the Free Lands, in Deeping Fens, and other Fens, in the County of Lincoln, therein mentioned, to raise a competent Sum of Money, for the effectual Draining and future Preservation of all the said Fens, according to their Agreement in that Behalf; and to carry the said Agreement into Execution; and for other Purposes therein mentioned." Hodie 1a vice lecta est Billa, intituled, "An Act for the better enlightening the open Places, Streets, Lanes, Passages, and Courts, and for the better regulating the Nightly Watch and Beadles, within the Parish of Christ Church, in the County of Middlesex." The House (according to Order) was adjourned during Pleasure, and put into a Committee upon the Bill, intituled, "An Act for granting to His Majesty the Sum of Two Millions, for the Service of the Year One Thousand Seven Hundred and Thirty-eight; and for paying to the Governor and Company of the Bank of England One Million, for redeeming an Annuity of Forty Thousand Pounds, payable to them; and for the further appropriating the Supplies granted in this Session of Parliament." Hodie 2a vice lecta est Billa, intituled, "An Act for punishing such Persons as shall do Injuries or Violences to the Persons and Properties of His Majesty's Subjects, with Intent to hinder the Exportation of Corn." Hodie 2a vice lecta est Billa, intituled, "An Act for enforcing the Execution of an Act made in the Ninth Year of His present Majesty's Reign, intituled, An Act for laying a Duty upon the Retailers of Spirituous Liquors; and for licensing the Retailers thereof." Stepney, &c. against Shoreditch Road, Bill. It is Ordered, That the Petitioners may be heard, by their Counsel, against the said Bill, at the Second Reading thereof. Ordered, That only One Counsel on each Petition be permitted to be heard against the Bill. Then the Counsel on both Parts were called in; and the Bill was (according to Order) read a Second Time. Proposed, "To commit the Bill." Dominus Cancellarius declaravit præsens Parliamentum continuandum esse usque ad et in diem Lunæ, octavum diem instantis Maii, hora undecima Auroræ, Dominis sic decernentibus. Privilege Act, to amend, Bill. With a Bill, intituled, "An Act to amend an Act passed in the Twelfth and Thirteenth Year of the Reign of King William the Third, intituled, An Act for preventing any Inconveniences that may happen by Privilege of Parliament;" to which they desire the Concurrence of this House. The Earl of Warwick reported from the Lords Committees to whom the Bill, intituled, "An Act for repairing the Road from Shoreditch Church, through Hackney, to Stanford Hill; and cross Cambridge Heath, over Bethnall Green, to the Turnpike at Mile-end, in the County of Middlesex," was committed: "That they had gone through the Bill, and directed him to report the same to the House, without any Amendment." 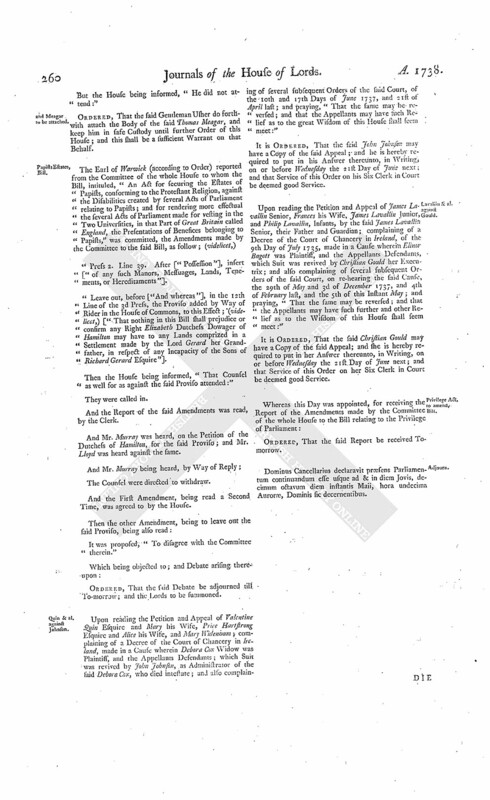 To return the Bill, intituled, "An Act for explaining and amending a certain Trust and Power contained in the Settlement made on the Marriage of Richard Lord Viscount Molyneux of the Kingdom of Ireland, with Mary Lady Molyneux his now Wife, for raising Portions for the Daughters of the said Marriage; and for the better ascertaining and more effectually securing the said Portions;" and to acquaint this House, that they have agreed to the same, without any Amendment. 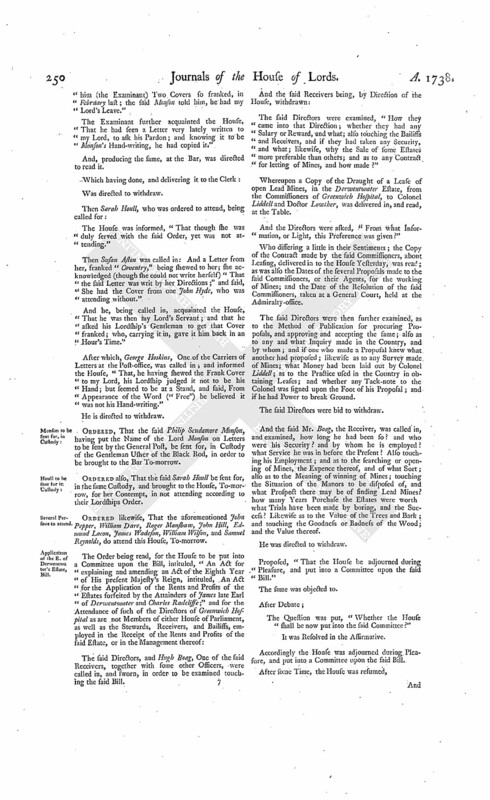 To return the Bill, intituled, "An Act to enable the Guardian of Amy Symes and Catherine Symes, Infants, to join in making Leases of Lands, in the Counties of Somerset and Devon, with the Owners thereof, during the Minority of the said Infants;" and to acquaint this House, that they have agreed to the same, without any Amendment. and Bernard, &c. Nat. Bill. To return the Bill, intituled, "An Act to naturalize Herman Bernard and John Bosquain;" and to acquaint this House, that they have agreed to the same, without any Amendment. Hodie 2a vice lecta est Billa, intituled, "An Act to enable the Adventurers, Owners, and Proprietors, of the Taxable Lands, and the Owners and Proprietors of the Free Lands, in Deeping Fens, and other Fens, in the County of Lincoln, therein mentioned, to raise a competent Sum of Money, for the effectual Draining and future Preservation of all the said Fens, according to their Agreement in that Behalf; and to carry the said Agreement into Execution; and for other Purposes therein mentioned." Viscount Lonsdale. L. Bp. Hereford. L. Bp. Bangor. L. Clifton. Upon reading the Petition of William Allanson Esquire, in Custody of the Serjeant at Arms attending this House, for causing several Elm Trees to be lopped and cut, on the Waste of the Manor of Isleworth Sion, belonging to the Duke of Somerset; acknowledging his Offence, begging Pardon for the same; and praying, "In regard the Petitioner is far advanced in Years, his close Confinement will much impair his Health, and be very prejudical to his private Affairs; that he may be discharged from his Confinement, at such Time, and in such Manner, as to the House shall seem proper:"
Allanson to be brought to the Bar. Against importing reprinted Books Abroad, Bill. Hodie 2a vice lecta est Billa, intituled, "An Act for prohibiting the Importation of Books re-printed Abroad, that were originally printed in Great Britain; and for limiting the Prices of Books." Christ Church, Middlesex, Nightly Watch, &c. Bill. Hodie 2a vice lecta est Billa, intituled, "An Act for the better enlightening the open Places, Streets, Lanes, Passages, and Courts, and for the better regulating the Nightly Watch and Beadles, within the Parish of Christ Church, in the County of Middlesex." Complaint was made to the House, "That the Hands of divers Lords had lately been counterfeited, in the franking of Letters to be sent by the General Post." And thereupon a general List of Persons, counterseiting such Hands being delivered in, the same was read. And some Lords present, whose Names were written on the Superscriptions of several Letters, declaring, "That the same were not their Hand-writing:"
Mr. White, at Mr. Wilkinson's, in Half Moon Street, in The Strand. H. Graham, Supervisor of Excise, at Saint Albans. Mr. William Wilson, at the Queen's Arms Tavern, opposite The Marshalsea, Southwark. Thomas Bradford, at Vaux Hall. Mr. Sallwood, in Phænix Street, Bloomsbury. Mr. Dare, in Twelve Bell Court, Bow Church Yard. Mr. Lacon, at his Chambers in Grays Inn. Mr. Reynolds, at Will's Coffee House, Cornhill. Mrs. Mary Downs, at Mr. Kitchin's, in King Street, Westminster, near the Abbey. Mr. Hutchinson, near The Lady and Cat, in Barnaby Street. Sarah Koull, at The King's Head, Oxford Road. Susan Aston, at Rothamstead, near Saint Albans. Prisoners in the King's Benet, &c. Relief, Bill. The House (according to Order) was adjourned during Pleasure, and put into a Committee upon the Bill, intituled, "An Act for the more effectual securing the Payments of certain Sums of Money, directed, by an Act made in the Forty-third Year of the Reign of Queen Elizabeth, intituled, "An Act for Relief of the Poor," to be paid by the respective Treasurers of every County in England and Wales, for the Relief of the poor Prisoners of The King's Bench and Marshalsea Prisons." 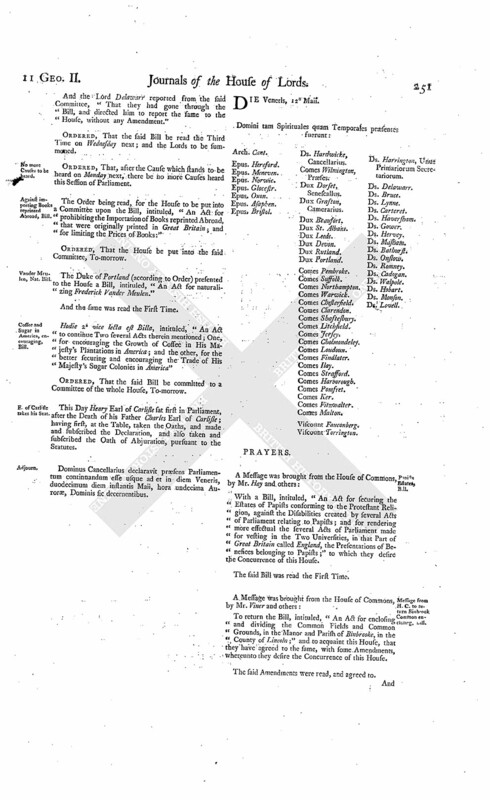 The Order of the Day being read, for the House to be put into a Committee upon the Bill, intituled, "An Act for explaining and amending an Act of the Eighth Year of His present Majesty's Reign, intituled, An Act for the Application of the Rents and Profits of the Estates forfeited by the Attainders of James late Earl of Derwentwater and Charles Radeliffe." It was moved, "That the House be put into a Committee upon the said Bill, on this Day Three Weeks." Ordered, That the House be put into a Committee upon the said Bill, on Thursday next; and the Lords to be summoned. Ordered, That the proper Officer do lay before this House, a Copy or Copies of any Articles, or Contracts, that have been made by the Commissioners of Greenwich Hospital, for any Lease or Leases of any Mine or Mines in the Estate of the late Earl of Derwentwater, or any Proposal or Proposals for such Lease or Leases. and Stewards, &c. to attend. Ordered, That the said Commissioners do cause the Stewards, Receivers, and Bailiffs, employed in the Receipt of the Rents and Profits of the said Estate, or in the Management thereof, to attend this House on Thursday next. Upon reading the Petition of Joseph Cox, in Custody of the Serjeant at Arms attending this House, for a Breach of Privilege, in suffering an Ejectment to be served on a Tenant of the Duke of Argyle and Greenwich; acknowledging his Offence, promising not to be guilty of the like for the future; and praying, "In regard he is aged, and in very poor Circumstances, that he may be discharged out of Custody:"
Cox to be brought to the Bar. Hodie 3a vice lecta est Billa, intituled, "An Act for granting to His Majesty the Sum of Two Millions, for the Service of the Year One Thousand Seven Hundred and Thirty-eight; and for paying to the Governor and Company of the Bank of England One Million, for redeeming an Annuity of Forty Thousand Pounds, payable to them; and for the further appropriating the Supplies granted in this Session of Parliament." Hodie 2a vice lecta est Billa, intituled, "An Act to explain and amend an Act passed in the Eighth Year of His present Majesty's Reign, intituled, An Act for re-building the Parish Church of Saint Leonard, Shoreditch, in the County of Middlesex." Dominus Cancellarius declaravit præsens Parliamentum continuandum esse usque ad et in diem Martis, nonum diem instantis Maii, hora undecima Auroræ, Dominis sic decernentibus. Hodie 3a vice lecta est Billa, intituled, "An Act for repairing the Road from Shoreditch Church, through Hackney, to Stanford Hill, and cross Cambridge Heath, over Bethnall Green, to the Turnpike at Mile-end, in the County of Middlesex." Hodie 3a vice lecta est Billa, intituled, "An Act for the more effectual securing the Payments of certain Sums of Money, directed by an Act, made in the Forty-third Year of the Reign of Queen Elizabeth, intituled, "An Act for Relief of the Poor," to be paid by the respective Treasurers of every County in England and Wales, for the Relief of the poor Prisoners of the King's Bench and Marshalsea Prisons." The Earl of Warwick reported from the Lords Committees to whom the Bill, intituled, "An Act for enlarging the Terms and Powers granted by Two Acts of Parliament, One of the Fourth, and the other of the Sixth, Year of the Reign of His late Majesty King George the First, for repairing the Roads from The Stones-end in Kent Street, in the Parish of Saint George, in Southwark, in the County of Surrey (leading to the Lime Kilns in East-Greenwich), to the First Mill Pond at South End, in the Parish of Lewisham, in the County of Kent; and for amending the Road from Westminster Ferry, at Lambeth, in the said County of Surrey, to New Cross, in Deptford, in the said County of Kent; and for amending and making the said Acts more effectual; and for amending the Roads from the Lime Kilns aforesaid, to the Town of Dartford, in the said County; and from a Place called Saint Thomas a Waterings, in the said Parish of Saint George, to The Stones End in Bermondsey Street, in the said County of Surrey," was committed: That they had examined the Allegations of the Bill, which they found to be true; and that the Committee had gone through the Bill, and directed him to report the same to the House, without any Amendment." His Lordship also made the like Report from the Committee to whom the Bill, intituled, "An Act for enlarging the Term and Powers granted in and by an Act made in the Tenth Year of Her late Majesty Queen Anne, for enlarging, amending, and maintaining, the Road between Northfleet, Gravesend, and Rochester, in the County of Kent; and also another Act, made in the Eleventh Year of His late Majesty King George the First, for enlarging the Term granted by the said former Act; and for other Purposes therein mentioned; and for explaining and amending the said Acts; and also for repairing the Highway from Northfleet aforesaid to Dartford, in the said County," was committed. Privilege Act to amend, Bill. Hodie 2a vice lecta est Billa, intituled, "An Act to amend an Act passed in the Twelfth and Thirteenth Year of the Reign of King William the Third, intitituled, "An Act for preventing any Inconveniencies that may happen by Privilege of Parliament." The House (according to Order) was adjourned during Pleasure, and put into a Committee upon the Bill, intituled, "An Act for punishing such Persons as shall do Injuries or Violences to the Persons and Properties of His Majesty's Subjects, with Intent to hinder the Exportation of Corn." The House also (according to Order) was adjourned during Pleasure, and put into a Committee upon the Bill, intituled, "An Act for enforcing the Execution of an Act made in the Ninth Year of His present Majesty's Reign, intituled, An Act for laying a Duty upon the Retailers of Spirituous Liquors; and for licensing the Retailers thereof." And the same Report was made. Shipwrecked Mariners, Genoa, Relief, Bill. 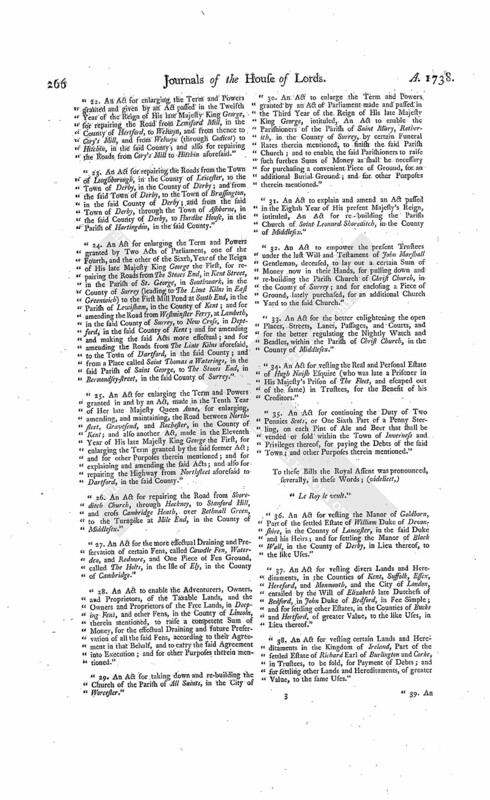 The Order of the Day being read, for the House to be put into a Committee upon the Bill, intituled, "An Act for collecting, at the Port of Genoa, certain small Sums, for Relief of Mariners shipwrecked and taken in War, and other distressed Persons, His Majesty's Subjects, and for other pious and charitable Uses." Ordered, That the House be put into a Committee thereupon, on this Day Fortnight. It is Ordered, That the further Hearing of this Cause be adjourned till To-morrow; and that the Cause appointed for that Day be put off to Friday next; and all the other Causes (except that for Monday, which stands to be heard peremptorily) to be removed in Course. D. of Somerset's Privilege; Allanson discharged. William Allanson Esquire, in Custody of the Serjeant at Arms attending this House, for a Breach of Privilege, in causing certain Elm Trees to be lopped and cut, upon the Waste of the Manor of Isleworth Syon, belonging to the Duke of Somerset, was (according to Order) brought to the Bar; where he, upon his Knees receiving a Reprimand from the Lord Chancellor for his said Offence, was discharged out of Custody, paying his Fees. D. of Greenwich's Privilege; Cox discharged. Joseph Cox, in the same Custody, for suffering an Ejectment to be served upon a Tenant of the Duke of Argyle and Greenwich, was also brought to the Bar; and in like Manner reprimanded, and discharged. Dominus Cancellarius declaravit præsens Parliamentum continuandum esse usque ad et in diem Mercurii, decimum diem instantis Maii, hora undecima Auroræ, Dominis sic decernentibus. Messages from H. C. to return the E. of Burlington's Bill. To return the Bill, intituled, "An Act for vesting certain Lands and Hereditaments, in the Kingdom of Ireland, Part of the settled Estate of Richard Earl of Burlington and Corke, in Trustees, to be sold, for Payment of Debts; and for settling other Lands and Hereditaments, of greater Value, to the same Uses," and to acquaint this House, that they have agreed to the same, with One Amendment, whereunto they desire their Lordships Concurrence. And a Message was sent to the House of Commons, by Mr. Elde and Mr. Allen, to acquaint them therewith. Ordered, That the proper Officer do lay before this House, the Report made by the Directors of Greenwich Hospital, on the 27th of January 1736/7, to the Governors or Commissioners of the said Hospital, upon the Proposals for taking Leases for winning and working of Mines, as well opened as not opened, in the Estates forfeited by the Attainder of James late Earl of Derwentwater, and Charles Radcliffe, on which a Lease was ordered. Ordered also, That such of the said Directors as are not Members of either House of Parliament do attend this House, To-morrow. With a Bill, intituled, "An Act to continue Two several Acts therein mentioned; One, for encouraging the Growth of Coffee in His Majesty's Plantations in America; and the other, for the better securing and encouraging the Trade of His Majesty's Sugar Colonies in America;" to which they desire the Concurrence of this House. Hodie 3a vice lecta est Billa, intituled, "An Act for punishing such Persons as shall do Injuries or Violences to the Persons and Properties of His Majesty's Subjects, with Intent to hinder the Exportation of Corn." Hodie 3a vice lecta est Billa, intituled, "An Act for enlarging the Terms and Powers granted by Two Acts of Parliament, One of the Fourth, and the other of the Sixth, Year of the Reign of His late Majesty King George the First, for repairing the Roads from The Stones-end in Kent Street, in the Parish of Saint George, in Southwark, in the County of Surrey, (leading to the Lime Kilns in East Greenwich) to the First Mill Pond at South End, in the Parish of Lewisham, in the County of Kent; and for amending the Road from Westminster Ferry, at Lambeth, in the said County of Surrey, to New Cross, in Deptford, in the said County of Kent; and for amending and making the said Acts more effectual; and for amending the Roads from the Lime Kilns aforesaid, to the Town of Dartford, in the said County; and from a Place called Saint Thomas a Waterings, in the said Parish of Saint George, to The Stones-end in Bermondsey Street, in the said County of Surrey." Hodie 3a vice lecta est Billa, intituled, "An Act for enlarging the Term and Powers granted in and by an Act made in the Tenth Year of Her late Majesty Queen Anne, for enlarging, amending, and maintaining, the Road between Northfleet, Gravesend, and Rochester, in the County of Kent; and also another Act, made in the Eleventh Year of His late Majesty King George the First, for enlarging the Term granted by the said former Act; and for other Purposes therein mentioned; and for explaining and amending the said Acts; and also for repairing the Highway from Northfleet aforesaid to Dartford, in the said County." The Earl of Warwick reported from the Lords Committees to whom the Bill, intituled, "An Act to explain and amend an Act passed in the Eighth Year of His present Majesty's Reign, intituled, An Act for re-building the Parish Church of Saint Leonard Shoreditch, in the County of Middlesex." was committed: That they had examined the Allegations thereof, which they found to be true; and that the Committee had gone through the Bill, and directed him to report the same to the House, without any Amendment." Contract for Leases of Mines, Derwentwater Estate, delivered. The House being informed, "That a Person from the Commissioners of Greenwich Hospital attended:"
"A Copy or Copies of any Article, or Contract, which have been made, by the Commissioners of Greenwich Hospital, for any Lease, or Leases, of any Mine or Mines, in the Estate of the late Earl of Derwentwater, or any Proposal or Proposals for such Leases." And the Title of the Paper was read, by the Clerk. 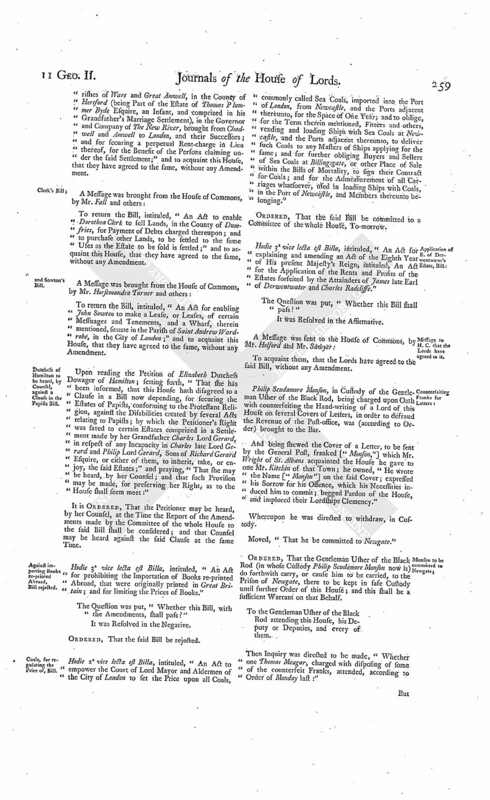 It is Ordered and Adjudged, by the Lords Spiritual and Temporal in Parliament assembled, That the said Decree complained of in the said Appeal be, and the same is hereby, reversed; and that an Accompt be taken, by a Master of the said Court of Chancery of Ireland, between the Appellant and the Respondents Martin Killikelly, and Arthur Lynch and Company of Bilboa, upon the Foot of the Charter-party mentioned in the Pleadings in this Cause; and that, in taking the said Accompt, the said Master do make to all Parties all just Allowances, and particularly an Allowance to the Appellant for the Freight of the Ship, according to the Terms of the Charter-party; and if it shall appear, upon the said Accompt, that any of the said Parties have paid, or advanced, towards the Purchase of the Homeward-bound Cargo of Fish, more Money than their Share thereof, according to the Proportions mentioned in the Charter-party, then the other Parties are, in such Accompt, to be charged with their proportionable Part thereof respectively; and what shall be found due upon the Balance of the Accompt before directed, from any of the Parties to the other, shall be paid accordingly: And it is further Ordered and Adjudged, That another Accompt be taken by the said Master, between the Appellant and the Respondents Martin Killikelly, and Arthur Lynch and Company of Bilboa, on the one Side, and the Respondent Catherine Killikelly, as Executrix of Luke Killikelly, on the other Side, of all the Dealings and Transactions between the said Appellant and the Respondents Martin Killikelly and Arthur Lynch and Company of Bilboa, and the said Luke Killikelly, as their Factor or Agent; in taking which Accompt, the said Master is to make to all Parties all just Allowances; and what shall be found due on the Balance of the said Accompt hereby last directed, from any of the said Parties to the other, shall be paid accordingly, pursuant to the Proportions mentioned in the Charter-party: And if, on the Balance of the said Accompt, any Thing shall be found due from the said Catherine Killikelly, as Executrix of the said Luke Killikelly, the same is to be paid by her, out of his Assets, in a Course of Administration; and if she shall not admit Assets of her said Testator, then the said Master shall take an Accompt of the Personal Estate of the said Luke Killikelly, come to the Hands of the said Catherine, or to the Hands of any other Person by her Order, or for her Use, and the same shall be applied in Satisfaction of what shall be so found due from her, in a Course of Administration as aforesaid; and, for the better clearing of the several Accompts before directed, all the Parties shall produce, before the said Master, upon Oath, all Books of Accompt, Papers, and Writings, relating to the Matters in Question, and shall be examined upon Interrogatories, as the said Master shall direct; and if any Difficulty shall arise before the said Master, he stall state the same specially, for the Judgement of the said Court; and the said Master shall make separate Reports upon the Accompts hereby respectively directed, between the Appellant and the said Respondents Martin Killikelly, and Arthur Lynch and Company of Bilboa, and between the said Catherine Killikelly and all the said other Parties; and the Consideration of Interest and Costs, and of all other Matters relating to the said Accompt hereby first directed, is reserved till after the said Master shall have made his Report upon that Accompt; and the Consideration of Interest and Costs, and of all other Matters relating to the said other Accompts hereby directed, is also reserved till after the said Master shall have made his Report upon the said other Accompts; and the said Court shall give all necessary and proper Directions for carrying this Judgement into Execution, as there shall be Occasion. Persons to attend, about franking Letters. Ordered, That the same Persons do attend this House To-morrow, in relation to the Matter of the said Complaint. Dormer against Parkhurst & al. in Error; Judges to attend. Ordered, That the Judges do attend this House on Monday next, when the Errors upon a Writ of Error, wherein Samuel Berington, on the Demise of John Dormer Esquire, is Plaintiff, and John Parkhurst Esquire and others are Defendants, are appointed to be argued. Dominus Cancellarius declaravit præsens Parliamentum continuandum esse usque ad et in diem Jovis, undecimum diem instantis Maii, hora undecima Auroræ, Dominis sic decernentibus. Message from H. C. to return Studholm's Bill. To return the Bill, intituled, "An Act for confirming and establishing an Agreement between William Studholm Gentleman and Cuthbert Hodgson Gentleman, in relation to the Will and Estate of Michael Studholm Esquire, deceased;" and to acquaint this House, than they have agreed to the same, without any Amendment. Report from Directors Greenwich Hospital, delivered. He was called in; and delivered, at the Bar, (pursuant to the Order of this House, Yesterday) the Report made by the Directors of Greenwich Hospital, on 27th January 1736/7, to the Governors or Commissioners of the said Hospital, upon the Proposals for taking of Leases for winning and working of Mines, as well opened as not opened, in the Estates forfeited by the Attainder of James late Earl of Derwentwater and Charles Radcliffe, on which a Lease was obtained. The Lord Bathurst reported from the Lords Committees to whom the Bill, intituled, "An Act for Sale of Part of the Estate late of Robert Packer Esquire, deceased, in the County of Berks, for discharging Encumbrances thereupon," was committed: "That they had considered the said Bill, and examined the Allegations thereof, which they found to be true; that the Parties concerned had given their Consents; and that the Committee had gone through the Bill, and made some Amendments thereunto." The Earl of Shaftesbury reported from the Lords Committees to whom the Bill, intituled, "An Act to enable the Adventurers, Owners, and Proprietors, of the Taxable Lands, and the Owners and Proprietors of the Free Lands, in Deeping Fenns, and other Fens in the County of Lincoln, therein mentioned, to raise a competent Sum of Money, for the effectual Draining and future Preservation of all the said Fens, according to their Agreement in that Behalf; and to carry the said Agreement into Execution; and for other Purposes therein mentioned," was committed: "That they had examined the Allegations thereof, which they found to be true; and that the Committee had gone through the Bill, and directed him to report the same to the House, without any Amendment." Message from H. C. to return Speen Mead enclosing Bill. To return the Bill, intituled, "An Act for enclosing and dividing the Common Mead, or Moor, called Speen Mead, or Speen Moor, in the County of Berks;" and to acquaint this House, that they have agreed to the same, with some Amendments, whereunto they desire their Lordships Concurrence. And a Message was sent to the House of Commons, by Mr. Thurston and Mr. Burroughs, to acquaint them therewith. Message from thence, for a Conference on the Bill to prevent Frauds by Tenants. To desire a Conference with this House, upon the Subject-matter of the Amendments made by their Lordships to the Bill, intituled, "An Act for the more effectual securing the Payment of Rents, and preventing Frauds by Tenants." And the Messengers were called in; and told, "That the Lords do agree to a Conference, as is desired; and appoint To-morrow, at Two a Clock, in the Painted Chamber." Vander Meulen to be naturalized, Bill. Mr. H. Graham, Supervisor of Excise at Saint Albans, attending, he was called in: And the Superscription of a Letter, franked "Monson," being shewed to him; he owned, "The Letter enclosed was from him; and that he had the said Cover of Mr. Kitchin, at Saint Albans." The said Kitchin attending, he was called in, and sworn: And, being asked how he came by it, said, "He had it of Mr. Wright, an Attorney in that Town, whose Christian Name is Edward; and that one Mr. Overall knows Wright gave it him." Whereupon the said Overall attending, he was called in; and, being sworn, declared, "That the said Wright acknowledged, that he gave it to the said Kitchin, and that he had it of one Meagar." Ordered, That the said Wright be sent for, in Custody of the Serjeant at Arms. Next, Mr. Wilson was called in: And the Superscription to a Letter from him, enclosed, franked "Monson," being shewed to him; he acknowledged, "The Letter was wrote by his Direction; and, that the Frank was given to him by John Pepper, in The Marshalsea, about the latter End of March last, who said, "he had it of Mr. Monson." Then William Dare, a Clergyman, was called in: And the Superscription of a Letter, franked "Monson," being shewed to him; he owned, "The enclosed Letter was of his Hand-writing; and that the Frank was sent to him by one Roger Manshaw, who lives upon Ludgate Hill." Next, Mr. Sallwood was called in: And the Superscription of a Letter, franked "Monson," being shewed to him; he acknowledged, "The enclosed Letter, from him to his Wife, to be of his own Hand-writing; but, that the Cover so franked, as also another, to convey a Letter from his Wife to him, franked with the same Name, were given to him by one John Hill, who keeps a Smith's Shop in Phænix Street, Bloomsbury; who said, he had them of one Monson; and further said, The said covers were brought to him by Hill's Wife." Next, Edmund Lacon was called in: And a Letter from John Pitcairne, at Yarmouth, directed to Mr. James Pitcairne, at his the said Lacon's Chambers in Grays Inn, franked "Monson," being shewed to him; he said, "It was John Pitcairne's Hand-writing; and he believed he had the franked Cover of his Son, to whom it was directed, who said, he had it of a Relation of the Lord Monson. The said Pitcairne is now in Norfolk." Then, James Wadeson was called in; and, being examined, acquainted the House, "That he had seen Pitcairne deliver several Franks to the said Mr. Lacon, with the Name of Monson;" and further said, "He was the said Lacon's Clerk." Next, William Reynolds was called in: And a Letter from him, franked "Monson," being shewed to him; he owned it to be his Hand-writing; and said, "He had the Frank of Mr. Monson, a Relation of my Lord Monson, then or lately a Prisoner in The Marshalsea, whose Name is Philip Scudamore Monson, who gave him (the Examinant) Two Covers so franked, in February last; the said Monson told him, he had my Lord's Leave." The Examinant further acquainted the House, "That he had seen a Letter very lately written to my Lord, to ask his Pardon; and knowing it to be Monson's Hand-writing, he had copied it." And, producing the same, at the Bar, was directed to read it. The House was informed, "That though she was duly served with the said Order, yet was not attending." Then Susan Aston was called in: And a Letter from her, franked "Coventry," being shewed to her; she acknowledged (though she could not write herself) "That the said Letter was writ by her Directions;" and said, She had the Cover from one John Hyde, who was attending without." And he, being called in, acquainted the House, "That he was then my Lord's Servant; and that he asked his Lordship's Gentleman to get that Cover franked; who, carrying it in, gave it him back in an Hour's Time." After which, George Hoskins, One of the Carriers of Letters at the Post-office, was called in; and informed the House, "That, he having shewed the Frank Cover to my Lord, his Lordship judged it not to be his Hand; but seemed to be at a Stand, and said, From Appearance of the Word ("Free") he believed it was not his Hand-writing." Ordered, That the said Philip Scudamore Monson, having put the Name of the Lord Monson on Letters to be sent by the General Post, be sent for, in Custody of the Gentleman Usher of the Black Rod, in order to be brought to the Bar To-morrow. Ordered also, That the said Sarah Houll be sent for, in the same Custody, and brought to the House, To-morrow, for her Contempt, in not attending according to their Lordships Order. Ordered likewise, That the aforementioned John Pepper, William Dare, Roger Manshaw, John Hill, Edmund Lacon, James Wadeson, William Wilson, and Samuel Reynolds, do attend this House, To-morrow. The said Directors, and Hugh Boag, One of the said Receivers, together with some other Officers, were called in, and sworn, in order to be examined touching the said Bill. The said Directors were examined, "How they came into that Direction; whether they had any Salary or Reward, and what; also touching the Bailiffs and Receivers, and if they had taken any Security, and what; likewise, why the Sale of some Estates more preferable than others; and as to any Contract for letting of Mines, and how made?" Whereupon a Copy of the Draught of a Lease of open Lead Mines, in the Derwentwater Estate, from the Commissioners of Greenwich Hospital, to Colonel Liddell and Doctor Lowther, was delivered in, and read, at the Table. And the Directors were asked, "From what Information, or Light, this Preference was given?" 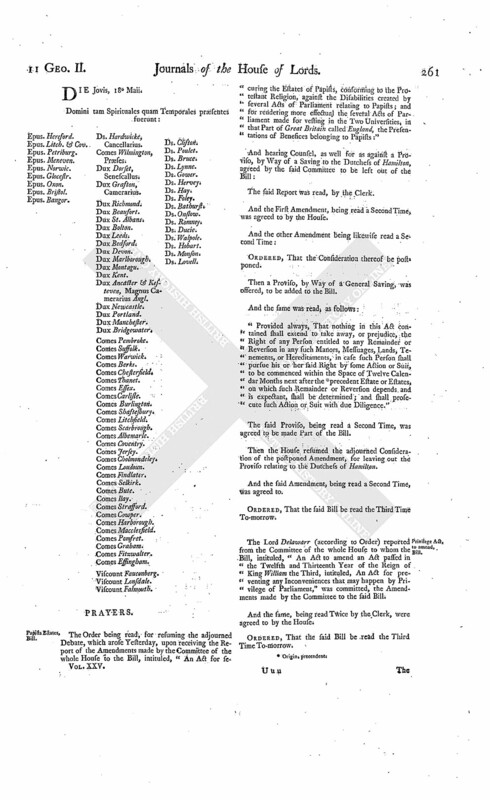 Who differing a little in their Sentiments; the Copy of the Contract made by the said Commissioners, about Leasing, delivered in to the House Yesterday, was read; as was also the Dates of the several Proposals made to the said Commissioners, or their Agents, for the working of Mines; and the Date of the Resolution of the said Commissioners, taken at a General Court, held at the Admiralty-office. The said Directors were then further examined, as to the Method of Publication for procuring Proposals, and approving and accepting the same; also as to any and what Inquiry made in the Country, and by whom; and if one who made a Proposal knew what another had proposed; likewise as to any Survey made of Mines; what Money had been laid out by Colonel Liddell; as to the Practice used in the Country in obtaining Leases; and whether any Tack-note to the Colonel was signed upon the Foot of his Proposal; and if he had Power to break Ground. The said Directors were bid to withdraw. And the said Mr. Boag, the Receiver, was called in, and examined, how long he had been so? and who were his Security? and by whom he is employed? what Service he was in before the Present? Also touching his Employment; and as to the searching or opening of Mines, the Expence thereof, and of what Sort; also as to the Meaning of winning of Mines; touching the Situation of the Manors to be disposed of, and what Prospect there may be of finding Lead Mines? how many Years Purchase the Estates were worth what Trials have been made by boring, and the Success? Likewise as to the Value of the Trees and Bark; and touching the Goodness or Badness of the Wood; and the Value thereof. Proposed, "That the House be adjourned during Pleasure, and put into a Committee upon the said Bill." The Question was put, "Whether the House shall be now put into the said Committee?" Accordingly the House was adjourned during Pleasure, and put into a Committee upon the said Bill. Ordered, That the said Bill be read the Third Time on Wednesday next; and the Lords to be summoned. No more Causes to be heard. Ordered, That, after the Cause which stands to be heard on Monday next, there be no more Causes heard this Session of Parliament. The Order being read, for the House to be put into a Committee upon the Bill, intituled, "An Act for prohibiting the Importation of Books reprinted Abroad, that were originally printed in Great Britain; and for limiting the Prices of Books:"
Ordered, That the House be put into the said Committee, To-morrow. The Duke of Portland (according to Order) presented to the House a Bill, intituled, "An Act for naturalizing Frederick Vander Meulen." Coffee and Sugar in America, encouraging, Bill. Hodie 2a vice lecta est Billa, intituled, "An Act to continue Two several Acts therein mentioned; One, for encouraging the Growth of Coffee in His Majesty's Plantations in America; and the other, for the better securing and encouraging the Trade of His Majesty's Sugar Colonies in America"
E. of Carlisle takes his Seat. This Day Henry Earl of Carlisle sat first in Parliament, after the Death of his Father Charles Earl of Carlisle; having first, at the Table, taken the Oaths, and made and subscribed the Declaration, and also taken and subscribed the Oath of Abjuration, pursuant to the Statutes. Dominus Cancellarius declaravit præsens Parliamentum continuandum esse usque ad et in diem Veneris, duodecimum diem instantis Maii, hora undecima Auroræ, Dominis sic decernentibus. 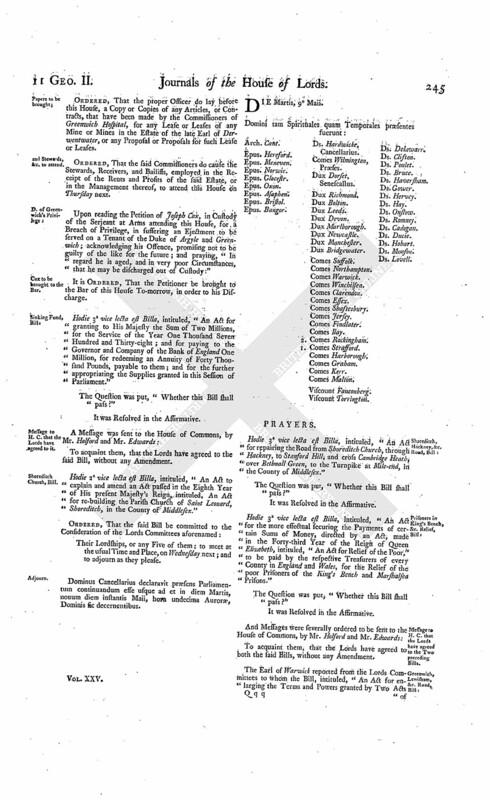 With a Bill, intituled, "An Act for securing the Estates of Papists conforming to the Protestant Religion, against the Disabilities created by several Acts of Parliament relating to Papists; and for rendering more effectual the several Acts of Parliament made for vesting in the Two Universities, in that Part of Great Britain called England, the Presentations of Benefices belonging to Papists;" to which they desire the Concurrence of this House. Message from H. C. to return Binbrook Common enclosing, Bill. 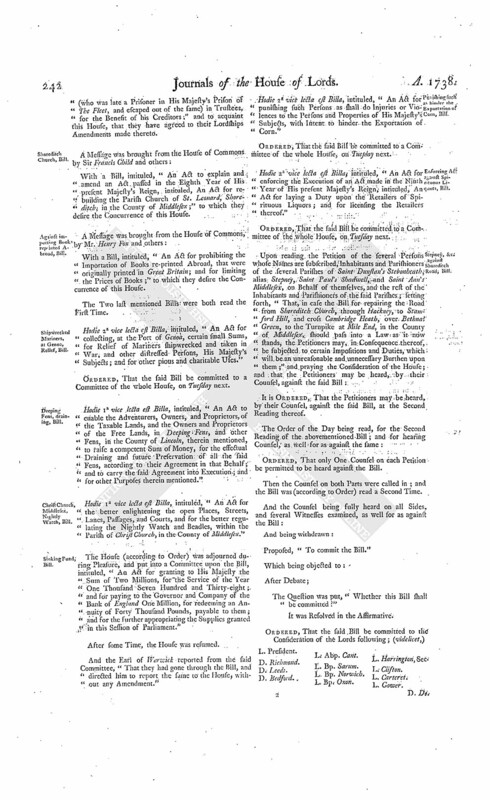 To return the Bill, intituled, "An Act for enclosing and dividing the Common Fields and Common Grounds, in the Manor and Parish of Binbrooke, in the County of Lincoln;" and to acquaint this House, that they have agreed to the same, with some Amendments, whereunto they desire the Concurrence of this House. Hodie 3a vice lecta est Billa, intituled, "An Act for Sale of Part of the Estate late of Robert Packer Esquire, deceased, in the County of Berks, for discharging Encumbrances thereupon." Hodie 3a vice lecta est Billa, intituled, "An Act to enable the Adventurers, Owners, and Proprietors, of the Taxable Lands, and the Owners and Proprietors of the Free Lands, in Deeping Fens, and other Fens in the County of Lincoln, therein mentioned, to raise a competent Sum of Money, for the effectual Draining and future Preservation of all the said Fens, according to their Agreement in that Behalf; and to carry the said Agreement into Execution; and for other Purposes therein mentioned." Gambier against Gale, in Error. James Gambier Esquire is Plaintiff, against William Gale Defendant. Hodie 1a vice lecta est Billa, intituled, "An Act for the Amendment of the Law relating to the Administration of the Assets of Persons dying insolvent, and for an equitable Division thereof amongst their Creditors." Hodie 3a vice lecta est Billa, intituled, "An Act to explain and amend an Act passed in the Eighth Year of His present Majesty's Reign, intituled, "An Act for re-building the Parish Church of St. Leonard Shoreditch, in the County of Middlesex." Hodie 3a vice lecta est Billa, intituled, "An Act for enforcing the Execution of an Act made in the Ninth Year of His present Majesty's Reign, intituled, An Act for laying a Duty upon the Retailers of Spirituous Liquors; and for licensing the Retailers thereof." And Messages were severally ordered to be sent to the House of Commons, by the former Messengers, to acquaint them therewith. E. Strafford. L. Bp. Glocester. Ld. Delawarr. "To the First Amendment made by your Lordships to the Bill, intituled, "An Act for the more effectual securing the Payment of Rents, and for preventing Frauds committed by Tenants," the Commons do agree. "To the 2d Amendment, for leaving out from the Word ["notwithstanding"], in the 13th Line of the 2d Press, to the Word ["and"], in the 34th Line of the next Press, the Commons do agree. "In the 21st Line of the 1st Press, after ["of"], insert ["Session in"]." "In Line 23d, Leave out ["Court"], and insert ["Courts."]." "In the 33d Line of the 2d Press of the said Clause, after ["Recognizance"], insert ["with One or Two sufficient Surety or Sureties."]. "To the other Amendments made by your Lordships, as far as the Amendment in Press 5, Line 23, the Commons do agree; but to that Amendment have agreed with an Amendment, (videlicet,) at the End add ["and"]. "To the next Amendment, which is for leaving out from the Word ["Statute"] in Press 7, Line 11, to the Words ["And whereas"], in the 24th Line of the same Press, the Commons do agree. "To Clause (B), the Commons disagree; because they conceive this Clause lays too great a Restraint upon Tenants, in the Sale of the Produce of their Lands. "To the other Amendments made by your Lordships, as far as the Amendment in Press 12, Line 1, the Commons do agree; but to that Amendment have agreed with an Amendment, (videlicet), after ["the"], and before ["Value"], insert ["Yearly"]. "To the next Amendment, Press 12, Lines 4, 5, and 6, the Commons disagree; because they conceive, that, if there be sufficient Distress upon the Premises, it is not reasonable to give the Justices of Peace the Power to go upon and view the same. "To the rest of the Amendments, the Commons do agree." 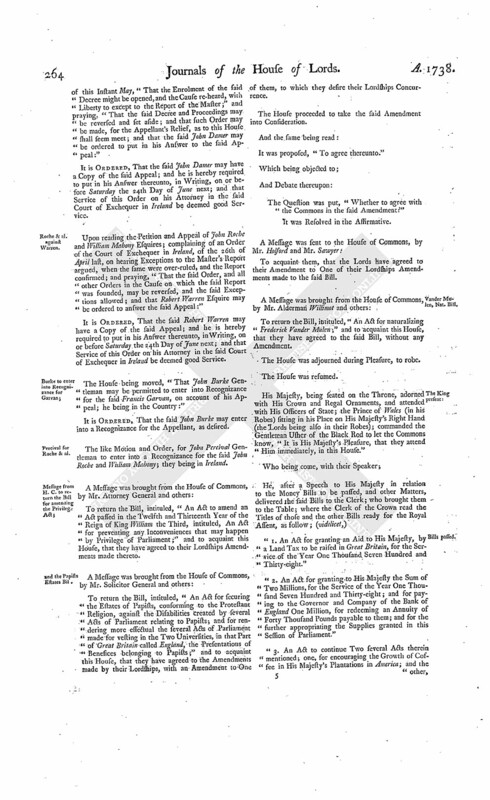 Which Report being read by the Clerk; the House agreed to the Amendments made by the Commons to some of their Lordships Amendments; and not to insist on their Amendments to which the Commons have disagreed. And a Message was sent to the House of Commons, by Mr. Thurston and Mr. Edwards, to acquaint them therewith. The Gentleman Usher of the Black Rod being called upon, to give an Account of what had been done, in relation to the taking of the Two Persons ordered Yesterday to be sent for in Custody; he acquainted the House, "That they both absconded, and were not to be found." Then the Serjeant at Arms, being called upon in like Manner, gave the same Account as to George Wright, ordered Yesterday to be sent for in Custody. And the House being informed, "That Roger Manshaw attended (according to Order):"
He was called in; and the Cover in which William Dare's Letter was enclosed, with Three blank ones franked in the same Manner with the Name "Monson," being shewed to him; he owned he had all those Covers of Mr. Monson, who told him, "He had Power to frank, as being Esquire to my Lord Monson when he was installed Knight of the Bath." And being asked if he gave any Thing for those Franks; declared, "He never did; nor had he heard any other Person had given Mr. Monson any Thing on that Occasion." Then John Hill, who keeps a Smith's Shop in Phœnix Street, Bloomsbury, was ordered to be called in. The Door-keeper, who served the Order for his Attendance, was called to the Bar; and acquainted the House, "That the said Hill was very aged and infirm, and could not possibly attend without the greatest Difficulty; but he heard him acknowledge, that Mr. Monson gave him franked Covers, in the Name of Monson, without his desiring them." Whereupon his Attendance was excused. Ordered, That the Three Persons who were directed to be sent for in Custody, if taken, be brought to the Bar on Wednesday next; and that the several other Persons (except John Hill) ordered before to attend do attend this House at the same Time. The House being informed, "That George Wright had surrendered himself to the Serjeant at Arms:"
He was, by their Lordships Direction, brought to the Bar. And the Superscription of a Letter, franked "Monson", enclosing a Letter from H. Graham, a Supervisor of Excise at Saint Albans, being shewed to him; he owned he made a Present of a Frank, in that Name, to the said Graham; and said, "He had it of one Thomas Meagar, who lives near Clear Market; who said, he had it of a Relation of my Lord Monson, whom the said Meagar produced to him this Morning, soon after he came to Town, at The Red Lyon in White Chapel, who acknowledged he signed the Franks in The Marshalsea Prison." The Examinant owned, "That, believing the Franks to be good, he had Four or Five; but declared he gave nothing for them." He further acquainted the House, "That the said Meagar promised to be here himself by this Time; and he wondered he was not come." He is directed to withdraw, in Custody. Ordered, That the said Thomas Meagar do attend this House on Wednesday next. He was a Second Time directed to withdraw, as before. Ordered, That he be brought to the Bar of this House on Monday next. The House (according to Order) was adjourned during Pleasure, and put into a Committee upon the Bill, intituled, "An Act for prohibiting the Importation of Books reprinted Abroad, that were originally printed in Great Britain; and for limiting the Prices of Books." The Earl of Warwick reported from the Lords Committees to whom the Bill, intituled, "An Act for the better enlightening the open Places, Streets, Lanes, Passages, and Courts, and for the better regulating the Nightly Watch and Beadles, within the Parish of Christ Church, in the County of Middlesex," was committed: "That they had examined the Allegations of the Bill, which were found to be true; and that the Committee had gone through the Bill, and directed him to report the same to the House, without any Amendment." 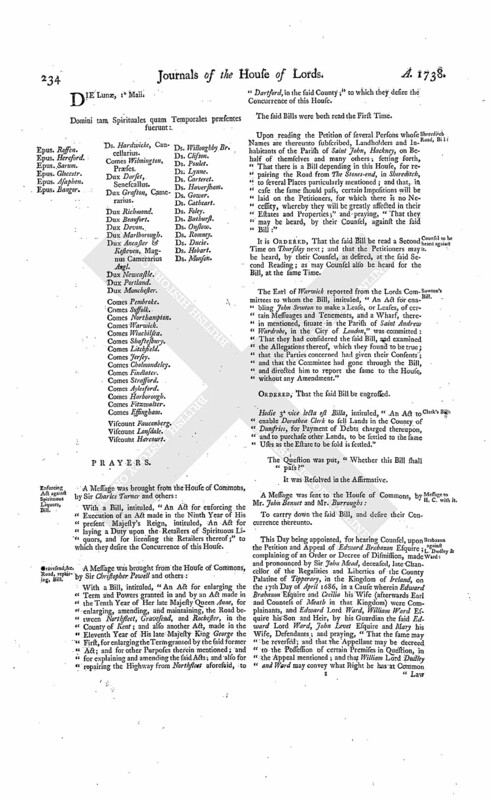 The Order being read, for the House to be in a Committee on the Bill, intituled, "An Act to amend an Act passed in the Twelfth and Thirteenth Year of the Reign of King William the Third, intituled, An Act for preventing any Inconveniences that may happen by Privilege of Parliament:"
Ordered, That the House be put into a Committee thereupon on Monday next; and the Lords to be summoned. Coffee and Sugar in America encouraging, Bill. The House (according to Order) was adjourned during Pleasure, and put into a Committee upon the Bill, intituled, "An Act to continue Two several Acts therein mentioned; One, for encouraging the Growth of Coffee in His Majesty's Plantations in America; and the other, for the better securing and encouraging the Trade of His Majesty's Sugar Colonies in America." 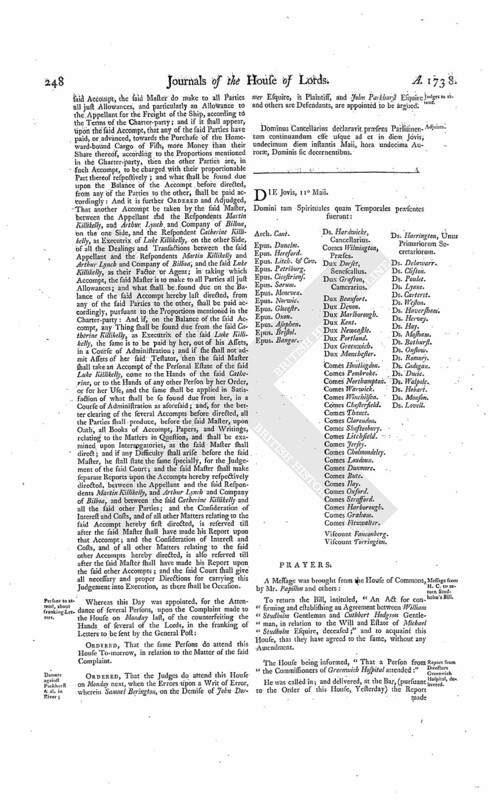 This Day being appointed, for hearing Counsel, upon the Petition and Appeal of John Coutts present Provost, and the other present Magistrates and Common Council, of the Borough of Montrose, for themselves, and in Behalf of the whole Corporation and Community of the said Borough; complaining of several Interlocutors of the Lords of Session in Scotland, of the 8th, 14th, 18th, and 22d of July, 1730, and 25th of June, the 28th of July, and 7th of December, 1731, the 8th of December 1732, the 9th, 11th, and 13th of January 1732/3, and 14th of February following, the 27th of June, 4th of July, and 19th of December, 1733, made on the Behalf of Mr. David Erskine; and praying, That the same may be reversed or varied, and such Relief given the Appellants as to this House shall seem meet:"
The Respondent's Counsel objected thereunto; and acquainted the House, "That, notwithstanding the Interest of the Crown was concerned in the Matter in Question; yet His Majesty's Advocate for Scotland was not made a Party to the said Appeal." And it appearing to the House, "That, though the Interest of the Crown was concerned, and His Majesty's Advocate made a Party below, yet the said Advocate is not made a Party to this Appeal; nor was the Cause finally determined by the said Lords of Session:"
It is therefore Ordered, by the Lords Spiritual and Temporal in Parliament assembled, That the said Petition and Appeal be, and is hereby, dismissed this House; and that it be, and is hereby, remitted to the Court of Session in Scotland, for that Court to proceed in the Cause according to Law and Justice, and to determine thereupon, with respect to the Points which remain undetermined; and that afterwards the Parties on either Side be at Liberty to appeal to this House, as they shall be advised. Dominus Cancellarius declaravit præsens Parliamentum continuandum esse usque ad et in diem Lunæ, decimum quintum diem instantis Maii, hora undecima Auroræ, Dominis sic decernentibus. Message from H. C. to return Packer's Bill. To return the Bill, intituled, "An Act for Sale of Part of the Estate late of Robert Packer Esquire, deceased, in the County of Berks, for discharging Encumbrances thereupon;" and to acquaint this House, that they have agreed to the Amendments made by their Lordships to the said Bill, with some Amendments to One of their Lordships Amendments, to which they desire the Concurrence of this House. The Earl of Warwick reported from the Lords Committees to whom the Bill, intituled, "An Act to naturalize Frederick Vander Meulen," was committed: That they had examined the Allegations of the said Bill, which they found to be true; and that the Committee had gone through the Bill, and directed him to report the same to the House, without any Amendment." Hodie 3a vice lecta est Billa, intituled, "An Act for the better enlightening the open Places, Streets, Lanes, Passages, and Courts, and for the better regulating the Nightly Watch and Beadles, within the Parish of Christ Church, in the County of Middlesex." Hodie 3a vice lecta est Billa, intituled, "An Act to continue Two several Acts therein mentioned; one, for encouraging the Growth of Coffee in His Majesty's Plantations in America; and the other, for the better securing and encouraging the Trade of His Majesty's Sugar Colonies in America." The Earl of Warwick (according to Order) reported from the Committee of the whole House, to whom the Bill, intituled, "An Act for prohibiting the Importation of Books reprinted Abroad, that were originally printed in Great Britain; and for limiting the Prices of Books," was committed, the Amendments made by the Committee to the said Bill. "Press 1. Line 23. After ["First"], insert ["composed or written, and"]. "L. 27. After ["First"], insert ["composed or written, and"]. "Press 2. Line 25. After ["being"], insert ["for that Part of Great Britain called England; and by the Lord President of the Session, Lord Justice General, Lord Chief Baron, and Rector of the College of Edinburgh, for that Part of Great Britain called Scotland, respectively"]. "L. 24. After ["being"], insert ["for that Part of Great Britain called England; and the Lord President of the Session, Lord Justice General, Lord Chief Baron, and Rector of the College of Edinburgh, for that Part of Great Britain called Scotland, respectively."]." 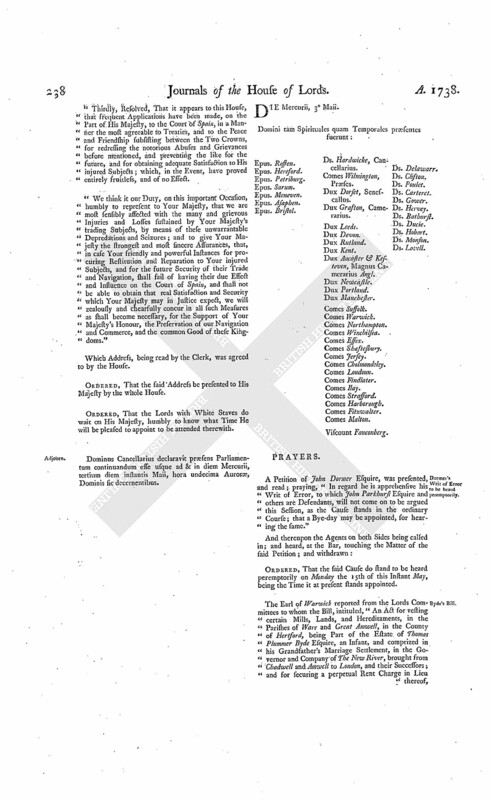 Which Amendments being read a Second Time; it was agreed to leave out ["the Rector of the College of Edinburgh"], and instead thereof insert ["Dean of the Faculty of Advocates"]. And, with that Alteration, the said Amendments were agreed to. The Gentleman Usher of the Black Rod was called upon, to give an Account of what had been done, pursuant to the Order on Friday last, for taking Philip Scudamore Monson into Custody. And he acquainted the House, "That the said Monson was in his Custody." Whereupon the said Edward Wright was directed to withdraw. and Monson to be brought to the Bar. Ordered, That he be discharged out of Custody, without paying any Fees; but to attend this House on Wednesday next; and that the said Monson be brought to the Bar at the same Time. Hodie 2a vice lecta est Billa, intituled, "An Act for securing the Estates of Papists conforming to the Protestant Religion, against the Disabilities created by several Acts of Parliament relating to Papists; and for rendering more effectual the several Acts of Parliament made for vesting in the Two Universities, in that Part of Great Britain called England, the Presentations of Benefices belonging to Papists." Hodie 3a vice lecta est Billa, intituled, "An Act to naturalize Frederick Vander Meulen." The House (according to Order) was adjourned during Pleasure, and put into a Committee upon the Bill, intituled, "An Act to amend an Act passed in the Twelfth and Thirteenth Year of the Reign of King William the Third, intituled, An Act for preventing any Inconveniences that may happen by Privilege of Parliament." And the Lord Delawarr reported from the said Committee, "That they had gone through the Bill, and made some Amendments thereunto; which they had directed him to report, when the House will please to receive the same." Berington, on the Demise of Dormer, against Parkhurst & al. in Error. It is Ordered, That the further Hearing of this Cause be adjourned till To-morrow; and that the Counsel be called in exactly at One a Clock. Dominus Cancellarius, declaravit præsens Parliamentum continuandum esse usque ad & in diem Martis, decimum sextum diem instantis Maii, hora undecima Auroræ, Dominis sic decernentibus. Coals, for regulating the Prices of, Bill. With a Bill, intituled, "An Act to empower the Court of Lord Mayor and Aldermen of the City of London to set the Price upon all Coals, commonly called Sea Coals, imported into the Port of London from Newcastle, and the Ports adjacent thereunto, for the Space of One Year; and to oblige, for the Term therein mentioned, Fitters and others vending and loading Ships with Sea Coals at Newcastle, and the Ports adjacent thereunto, to deliver such Coals to any Masters of Ships applying for the same; and for further obliging Buyers and Sellers of Sea Coals at Billingsgate, or other Place of Sale within the Bills of Mortality, to sign their Contract for Coals; and for the Admeasurement of of all Carriages whatsoever used in loading Ships with Coals, in the Port of Newcastle, and Members thereunto belonging;" to which they desire the Concurrence of this House. Heath against Short, in Error. Thomas Heath is Plaintiff, against Francis Short Defendant. 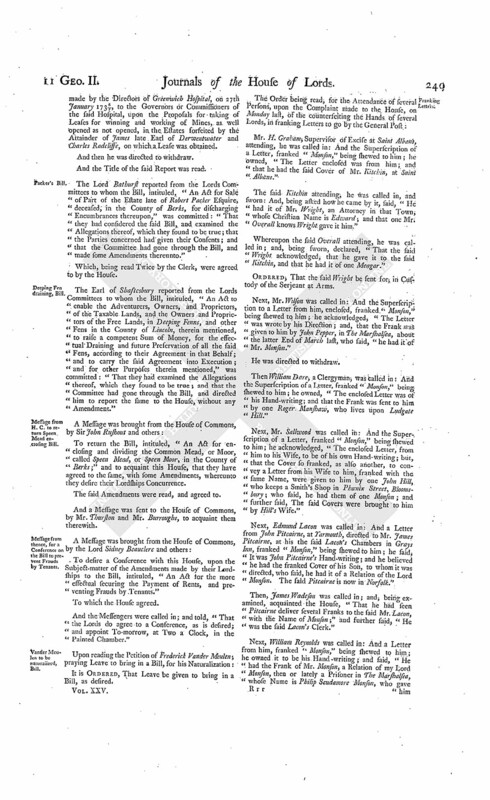 It is Ordered and Adjudged, by the Lords Spiritual and Temporal in Parliament assembled, That the said Judgement given in the said Court of King's Bench be, and the same is hereby, affirmed; and that the Record be remitted: And it is hereby further Ordered, That the Plaintiff in Error do pay, or cause to be paid, to the Defendants in Error, the Sum of Ten Pounds, for their Costs in this House. 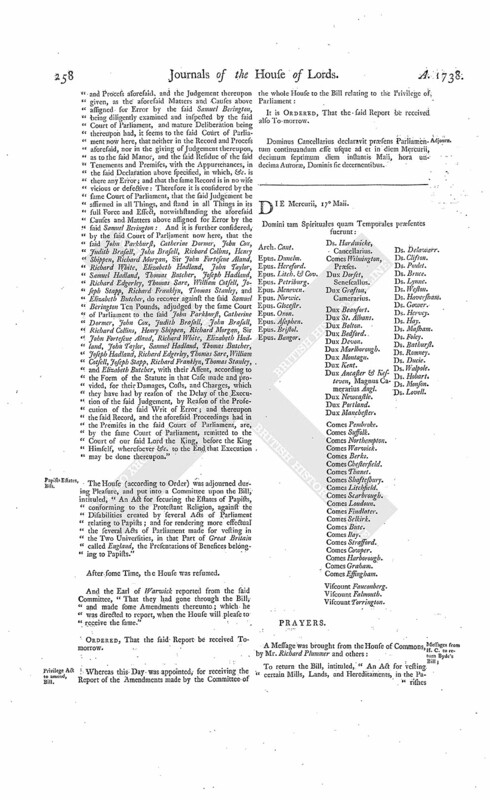 "At which Day, before the same Court of Parliament at Westminster, came as well the said Samuel Berington, as the said John Parkhurst, Catherine Dormer, John Cox, Judith Brasall, John Brasall, Richard Collins, Henry Shippen, Richard Morgan, Sir John Fortescue Aland, Richard White, Elizabeth Hadland, John Taylor, Samuel Hadland, Thomas Butcher, Joseph Hadland, Richard Edgerley, Thomas Sare, William Cotsell, Joseph Stapp, Richard Franklyn, Thomas Stanley, and Elizabeth Butcher, in their proper Persons: Whereupon, all and singular the Premises being seen and fully understood by the said Court of Parliament, and as well the Record and Process aforesaid, and the Judgement thereupon given, as the aforesaid Matters and Causes above assigned for Error by the said Samuel Berington, being diligently examined and inspected by the said Court of Parliament, and mature Deliberation being thereupon had, it seems to the said Court of Parliament now here, that neither in the Record and Process aforesaid, nor in the giving of Judgement thereupon, as to the said Manor, and the said Residue of the said Tenements and Premises, with the Appurtenances, in the said Declaration above specified, in which, &c. is there any Error; and that the same Record is in no wife vicious or defective: Therefore it is considered by the same Court of Parliament, that the said Judgement be affirmed in all Things, and stand in all Things in its full Force and Effect, notwithstanding the aforesaid Causes and Matters above assigned for Error by the said Samuel Berington: And it is further considered, by the said Court of Parliament now here, that the said John Parkhurst, Catherine Dormer, John Cox, Judith Brasall, John Brasall, Richard Collins, Henry Shippen, Richard Morgan, Sir John Fortescue Aland, Richard White, Elizabeth Hadland, John Taylor, Samuel Hadland, Thomas Butcher, Joseph Hadland, Richard Edgerley, Thomas Sare, William Cotsell, Joseph Stapp, Richard Franklyn, Thomas Stanley, and Elizabeth Butcher, do recover against the said Samuel Berington Ten Pounds, adjudged by the same Court of Parliament to the said John Parkhurst, Catherine Dormer, John Cox, Judith Brasall, John Brasall, Richard Collins, Henry Shippen, Richard Morgan, Sir John Fortescue Aland, Richard White, Elizabeth Hadland, John Taylor, Samuel Hadland, Thomas Butcher, Joseph Hadland, Richard Edgerley, Thomas Sare, William Cotsell, Joseph Stapp, Richard Franklyn, Thomas Stanley, and Elizabeth Butcher, with their Assent, according to the Form of the Statute in that Case made and provided, for their Damages, Costs, and Charges, which they have had by reason of the Delay of the Execution of the said Judgement, by Reason of the Prosecution of the said Writ of Error; and thereupon the said Record, and the aforesaid Proceedings had in the Premises in the said Court of Parliament, are, by the same Court of Parliament, remitted to the Court of our said Lord the King, before the King Himself, wheresoever &c. to the End that Execution may be done thereupon." The House (according to Order) was adjourned during Pleasure, and put into a Committee upon the Bill, intituled, "An Act for securing the Estates of Papists, conforming to the Protestant Religion, against the Disabilities created by several Acts of Parliament relating to Papists; and for rendering more effectual the several Acts of Parliament made for vesting in the Two Universities, in that Part of Great Britain called England, the Presentations of Benefices belonging to Papists." It is Ordered, That the said Report be received also To-morrow. Dominus Cancellarius declaravit præsens Parliamentum continuandum esse usque ad et in diem Mercurii, decimum septimum diem instantis Maii, hora undecima Auroræ, Dominis sic decernentibus. To return the Bill, intituled, "An Act for vesting certain Mills, Lands, and Hereditaments, in the Pa rishes of Ware and Great Amwell, in the County of Hertford (being Part of the Estate of Thomas Plummer Byde Esquire, an Infant, and comprized in his Grandfather's Marriage Settlement), in the Governor and Company of The New River, brought from Chadwell and Amwell to London, and their Successors; and for securing a perpetual Rent-charge in Lieu thereof, for the Benefit of the Persons claiming under the said Settlement;" and to acquaint this House, that they have agreed to the same, without any Amendment. To return the Bill, intituled, "An Act to enable Dorothea Clerk to sell Lands, in the County of Dumfries, for Payment of Debts charged thereupon; and to purchase other Lands, to be settled to the same Uses as the Estate to be sold is settled;" and to acquaint this House, that they have agreed to the same, without any Amendment. To return the Bill, intituled, "An Act for enabling John Sowton to make a Lease, or Leases, of certain Messuages and Tenements, and a Wharf, therein mentioned, situate in the Parish of Saint Andrew Wardrobe, in the City of London;" and to acquaint this House, that they have agreed to the same, without any Amendment. Dutchess of Hamilton to be heard, by Counsel, against a Clause in the Papists Bill. Upon reading the Petition of Elizabeth Dutchess Dowager of Hamilton; setting forth, "That she has been informed, that this House hath disagreed to a Clause in a Bill now depending, for securing the Estates of Papists, conforming to the Protestant Religion, against the Disabilities created by several Acts relating to Papists; by which the Petitioner's Right was saved to certain Estates comprized in a Settlement made by her Grandfather Charles Lord Gerard, in respect of any Incapacity in Charles late Lord Gerard and Philip Lord Gerard, Sons of Richard Gerard Esquire, or either of them, to inherit, take, or enjoy, the said Estates;" and praying, "That she may be heard, by her Counsel; and that such Provision may be made, for preserving her Right, as to the House shall seem meet:"
It is Ordered, That the Petitioner may be heard, by her Counsel, at the Time the Report of the Amendments made by the Committee of the whole House to the said Bill shall be considered; and that Counsel may be heard against the said Clause at the same Time. Against importing Books re-printed Abroad, Bill rejected. Hodie 3a vice lecta est Billa, intituled, "An Act for prohibiting the Importation of Books re-printed Abroad, that were originally printed in Great Britain; and for limiting the Prices of Books." Coals, for regulating the Price of, Bill. Hodie 2a vice lecta est Billa, intituled, "An Act to empower the Court of Lord Mayor and Aldermen of the City of London to set the Price upon all Coals, commonly called Sea Coals, imported into the Port of London, from Newcastle, and the Ports adjacent thereunto, for the Space of One Year; and to oblige, for the Term therein mentioned, Fitters and others, vending and loading Ships with Sea Coals at Newcastle, and the Ports adjacent thereunto, to deliver such Coals to any Masters of Ships applying for the same; and for further obliging Buyers and Sellers of Sea Coals at Billingsgate, or other Place of Sale within the Bills of Mortality, to sign their Contract for Coals; and for the Admeasurement of all Carriages whatsoever, used in loading Ships with Coals, in the Port of Newcastle, and Members thereunto belonging." 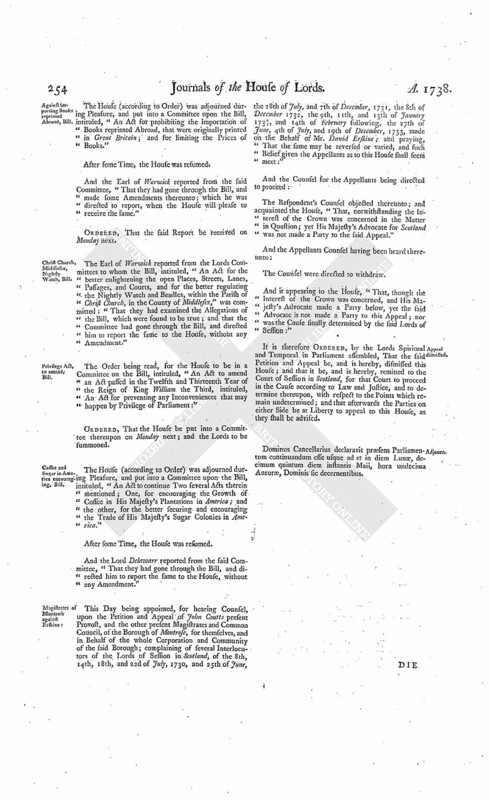 Hodie 3a vice lecta est Billa, intituled, "An Act for explaining and amending an Act of the Eighth Year of His present Majesty's Reign, intituled, An Act for the Application of the Rents and Profits of the Estates forfeited by the Attainders of James late Earl of Derwentwater and Charles Radcliffe." Philip Scudamore Monson, in Custody of the Gentleman Usher of the Black Rod, being charged upon Oath with counterseiting the Hand-writing of a Lord of this House on several Covers of Letters, in order to defraud the Revenue of the Post-office, was (according to Order) brought to the Bar. And being shewed the Cover of a Letter, to be sent by the General Post, franked ["Monson,"] which Mr. Wright of St. Albans acquainted the House he gave to one Mr. Kitchin of that Town; he owned, "He wrote the Name ["Monson"] on the said Cover; expressed his Sorrow for his Offence, which his Necessities induced him to commit; begged Pardon of the House, and implored their Lordships Clemency." Whereupon he was directed to withdraw, in Custody. Moved, "That he be committed to Newgate." Ordered, That the Gentleman Usher of the Black Rod (in whose Custody Philip Scudamore Monson now is) do forthwith carry, or cause him to be carried, to the Prison of Newgate, there to be kept in safe Custody until further Order of this House; and this shall be a sufficient Warrant on that Behalf. To the Gentleman Usher of the Black Rod attending this House, his Deputy or Deputies, and every of them. Then Inquiry was directed to be made, "Whether one Thomas Meagar, charged with disposing of some of the counterfeit Franks, attended, according to Order of Monday last:"
But the House being informed, "He did not attend:"
and Meagar to be attached. Ordered, That the said Gentleman Usher do forthwith attach the Body of the said Thomas Meagar, and keep him in safe Custody until further Order of this House; and this shall be a sufficient Warrant on that Behalf. "Press 2. Line 39. After ["Possession"], insert ["of any such Manors, Messuages, Lands, Tenements, or Hereditaments"]. "Leave out, before ["And whereas"], in the 12th Line of the 3d Press, the Proviso added by Way of Rider in the House of Commons, to this Effect; (videlicet,) ["That nothing in this Bill shall prejudice or confirm any Right Elizabeth Dutchess Dowager of Hamilton may have to any Lands comprized in a Settlement made by the Lord Gerard her Grandfather, in respect of any Incapacity of the Sons of Richard Gerard Esquire"]. Then the House being informed, "That Counsel as well for as against the said Proviso attended:"
And the Report of the said Amendments was read, by the Clerk. And Mr. Murray was heard, on the Petition of the Dutchess of Hamilton, for the said Proviso; and Mr. Lloyd was heard against the same. And the First Amendment, being read a Second Time, was agreed to by the House. It was proposed, "To disagree with the Committee therein." Ordered, That the said Debate be adjourned till To-morrow; and the Lords to be summoned. Quin & al. against Johnson. Upon reading the Petition and Appeal of Valentine Quin Esquire and Mary his Wife, Price Hartstrong Esquire and Alice his Wife, and Mary Widenham; complaining of a Decree of the Court of Chancery in Ireland, made in a Cause wherein Debora Cox Widow was Plaintiff, and the Appellants Defendants; which Suit was revived by John Johnson, as Administrator of the said Debora Cox, who died intestate; and also complaining of several subsequent Orders of the said Court, of the 10th and 17th Days of June 1737, and 21st of April last; and praying, "That the same may be reversed; and that the Appellants may have such Relief as to the great Wisdom of this House shall seem meet:"
It is Ordered, That the said John Johnson may have a Copy of the said Appeal; and he is hereby required to put in his Answer thereunto, in Writing, on or before Wednesday the 21st Day of June next; and that Service of this Order on his Six Clerk in Court be deemed good Service. Upon reading the Petition and Appeal of James Lavallin Senior, Frances his Wife, James Lavallin Junior, and Philip Lavallin, Infants, by the said James Lavallin Senior, their Father and Guardian; complaining of a Decree of the Court of Chancery in Ireland, of the 9th Day of July 1735, made in a Cause wherein Elinor Bagott was Plaintiff, and the Appellants Defendants, which Suit was revived by Christian Gould her Executrix; and also complaining of several subsequent Orders of the said Court, on re-hearing the said Cause, the 29th of May and 3d of December 1737, and 4th of February last, and the 5th of this Instant May; and praying, "That the same may be reversed; and that the Appellants may have such further and other Relief as to the Wisdom of this House shall seem meet:"
It is Ordered, That the said Christian Gould may have a Copy of the said Appeal; and she is hereby required to put in her Answer thereunto, in Writing, on or before Wednesday the 21st Day of June next; and that Service of this Order on her Six Clerk in Court be deemed good Service. Dominus Cancellarius declaravit præsens Parliamentum continuandum esse usque ad & in diem Jovis, decimum octavum diem instantis Maii, hora undecima Auroræ, Dominis sic decernentibus. 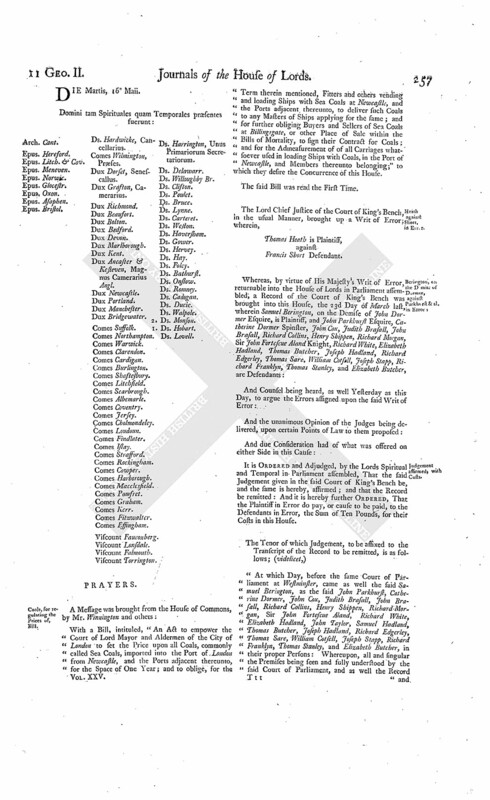 The Order being read, for resuming the adjourned Debate, which arose Yesterday, upon receiving the Report of the Amendments made by the Committee of the whole House to the Bill, intituled, "An Act for securing the Estates of Papists, conforming to the Protestant Religion, against the Disabilities created by several Acts of Parliament relating to Papists; and for rendering more effectual the several Acts of Parliament made for vesting in the Two Universities, in that Part of Great Britain called England, the Presentations of Benefices belonging to Papists:"
The said Report was read, by the Clerk. Ordered, That the Consideration thereof be postponed. Then a Proviso, by Way of a General Saving, was offered, to be added to the Bill. "Provided always, That nothing in this Act contained shall extend to take away, or prejudice, the Right of any Person entitled to any Remainder or Reversion in any such Manors, Messuages, Lands, Tenements, or Hereditaments, in case such Person shall pursue his or her said Right by some Action or Suit, to be commenced within the Space of Twelve Calendar Months next after the (fn. 1) precedent Estate or Estates, on which such Remainder or Reversion depends and is expectant, shall be determined; and shall prosecute such Action or Suit with due Diligence." The said Proviso, being read a Second Time, was agreed to be made Part of the Bill. Then the House resumed the adjourned Consideration of the postponed Amendment, for leaving out the Proviso relating to the Dutchess of Hamilton. And the said Amendment, being read a Second Time, was agreed to. The Lord Delawarr (according to Order) reported from the Committee of the whole House to whom the Bill, intituled, "An Act to amend an Act passed in the Twelfth and Thirteenth Year of the Reign of King William the Third, intituled, An Act for preventing any Inconveniences that may happen by Privilege of Parliament," was committed, the Amendments made by the Committee to the said Bill. The House (according to Order) was adjourned during Pleasure, and put into a Committee upon the Bill, intituled, "An Act to empower the Court of Lord Mayor and Aldermen of the City of London to set the Price upon all Coals, commonly called Sea Coals, imported into the Port of London, from Newcastle, and the Ports adjacent thereunto, for the Space of One Year; and to oblige, for the Term therein mentioned, Fitters and others vending and loading Ships with Sea Coals at Newcastle, and the Ports adjacent thereunto, to deliver such Coals to any Masters of Ships applying for the same; and for further obliging Buyers and Sellers of Sea Coals at Billingsgate, or other Places of Sale within the Bills of Mortality, to sign their Contract for Coals; and for the Admeasurement of all Carriages whatsoever, used in loading Ships with Coals, in the Port of Newcastle, and Members thereunto belonging." And the Duke of Portland reported from the said Committee, "That they had gone through the Bill, and directed him to report the same to the House, without any Amendment." The House being moved, "That John Percival Gentleman may be permitted to enter into Recognizance for Valentine Quin Esquire and others, on account of their Appeal depending in this House; they being in Ireland:"
The like Motion and Order, for the said John Percival to enter into a Recognizance for James Lavallin and others; for a Reason of the same Nature. Dominus Cancellarius declaravit præsens Parliamentum continuandum esse usque ad & in diem Veneris, decimum nonum diem instantis Maii, hora undecima Auroræ, Dominis sic decernentibus. Hodie 3a vice lecta est Billa, intituled, "An Act to empower the Court of Lord Mayor and Aldermen of the City of London to set the Price upon all Coals, commonly called Sea Coals, imported into the Port of London, from Newcastle, and the Ports adjacent thereunto, for the Space of One Year; and to oblige, for the Term therein mentioned, Fitters and others vending and loading Ships with Sea Coals at Newcastle, and the Ports adjacent thereunto, to deliver such Coals to any Masters of Ships applying for the same; and for further obliging Buyers and Sellers of Sea Coals at Billingsgate, or other Place of Sale within the Bills of Mortality, to sign their Contract for Coals; and for the Admeasurement of all Carriages whatsoever, used in loading Ships with Coals in the Port of Newcastle, and Members thereunto belonging." Hodie 3a vice lecta est Billa, intituled, "An Act to amend an Act passed in the Twelfth and Thirteenth Year of the Reign of King William the Third, intituled, An Act for preventing any Inconveniences that may happen by Privilege of Parliament." Hodie 3a vice lecta est Billa, intituled, "An Act for securing the Estates of Papists, conforming to the Protestant Religion, against the Disabilities created by several Acts of Parliament relating to Papists; and for rendering more effectual the several Acts of Parliament made for vesting in the Two Universities, in that Part of Great Britain called England, the Presentations of Benefices belonging to Papists." A Message was sent to the House of Commons, by the same Messengers, to the like Purpose. Dominus Cancellarius declaravit præsens Parliamentum continuandum esse usque ad & in diem Sabbati, vicesimum diem instantis Maii, hora undecima Auroræ, Dominis sic decernentibus. Upon reading the Petition and Appeal of Francis Garvan Gentleman; complaining of an Order and Decree of the Court of Exchequer in Ireland, the 29th Day of January 1735, made in a Cause wherein John Damer and Joseph Damer Esquires, Executors of the last Will and Testament of Joseph Damer Esquire, were Plaintiffs, and the Appellant was Defendant; and of several subsequent Proceedings, particularly in the said Court's refusing a Motion, made the 12th and 13th Days of this Instant May, "That the Enrolment of the said Decree might be opened, and the Cause re-heard, with Liberty to except to the Report of the Master;" and praying. "That the said Decree and Proceedings may be reversed and set aside; and that such Order may be made, for the Appellant's Relief, as to this House shall seem meet; and that the said John Damer may be ordered to put in his Answer to the said Appeal:"
It is Ordered, That the said John Damer may have a Copy of the said Appeal; and he is hereby required to put in his Answer thereunto, in Writing, on or before Saturday the 24th Day of June next; and that Service of this Order on his Attorney in the said Court of Exchequer in Ireland be deemed good Service. 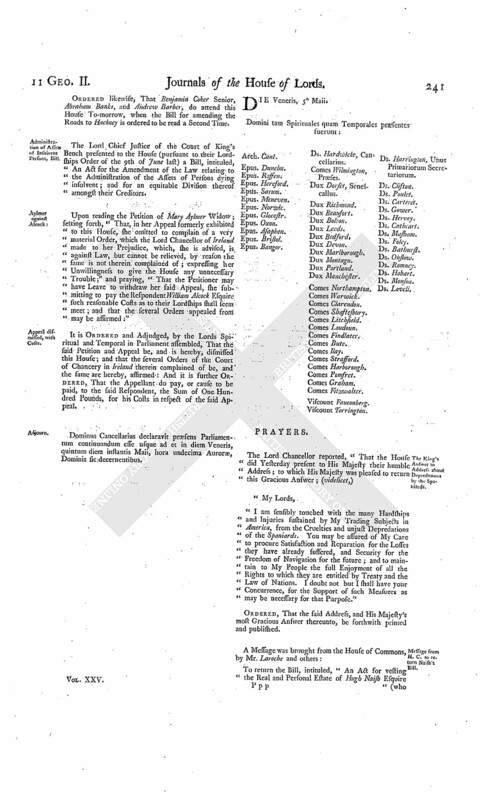 Upon reading the Petition and Appeal of John Roche and William Mahony Esquires; complaining of an Order of the Court of Exchequer in Ireland, of the 26th of April last, on hearing Exceptions to the Master's Report argued, when the same were over-ruled, and the Report confirmed; and praying, "That the said Order, and all other Orders in the Cause on which the said Report was founded, may be reversed, and the said Exceptions allowed; and that Robert Warren Esquire may be ordered to answer the said Appeal:"
It is Ordered, That the said Robert Warren may have a Copy of the said Appeal; and he is hereby required to put in his Answer thereunto, in Writing, on or before Saturday the 24th Day of June next; and that Service of this Order on his Attorney in the said Court of Exchequer in Ireland be deemed good Service. The House being moved, "That John Burke Gentleman may be permitted to enter into Recognizance for the said Francis Garvan, on account of his Appeal; he being in the Country:"
It is Ordered, That the said John Burke may enter into a Recognizance for the Appellant, as desired. Percival for Roche & al. The like Motion and Order, for John Percival Gentleman to enter into a Recognizance for the said John Roche and William Mahony; they being in Ireland. 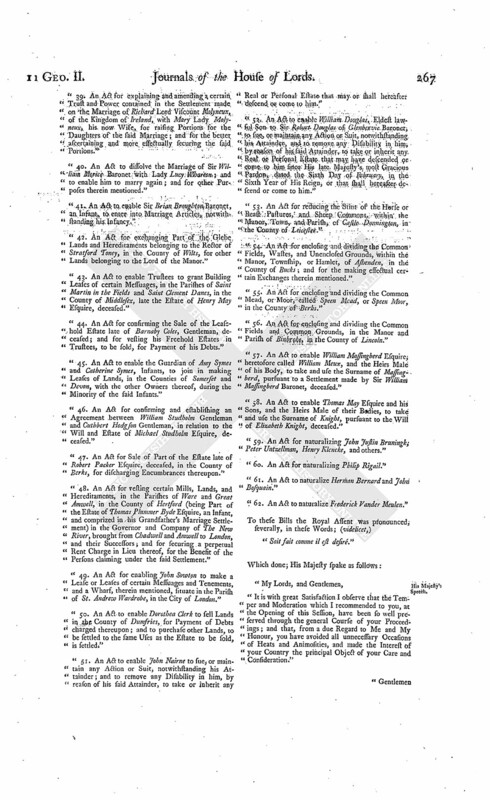 To return the Bill, intituled, "An Act to amend an Act passed in the Twelfth and Thirteenth Year of the Reign of King William the Third, intituled, An Act for preventing any Inconveniences that may happen by Privilege of Parliament;" and to acquaint this House, that they have agreed to their Lordships Amendments made thereto. and the Papists Estates Bill. 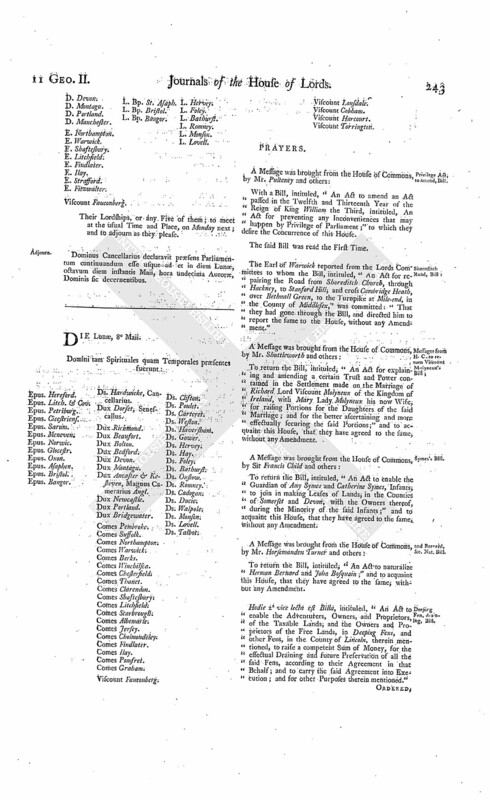 To return the Bill, intituled, "An Act for securing the Estates of Papists, conforming to the Protestant Religion, against the Disabilities created by several Acts of Parliament relating to Papists; and for rendering more effectual the several Acts of Parliament made for vesting in the Two Universities, in that Part of Great Britain called England, the Presentations of Benefices belonging to Papists;" and to acquaint this House, that they have agreed to the Amendments made by their Lordships, with an Amendment to One of them, to which they desire their Lordships Concurrence. It was proposed, "To agree thereunto." The Question was put, "Whether to agree with the Commons in the said Amendment?" To acquaint them, that the Lords have agreed to their Amendment to One of their Lordships Amendments made to the said Bill. To return the Bill, intituled, "An Act for naturalizing Frederick Vander Mulen;" and to acquaint this House, that they have agreed to the said Bill, without any Amendment. His Majesty, being seated on the Throne, adorned with His Crown and Regal Ornaments, and attended with His Officers of State; the Prince of Wales (in his Robes) sitting in his Place on His Majesty's Right Hand (the Lords being also in their Robes); commanded the Gentleman Usher of the Black Rod to let the Commons know, "It is His Majesty's Pleasure, that they attend Him immediately, in this House." "1. An Act for granting an Aid to His Majesty, by a Land Tax to be raised in Great Britain, for the Service of the Year One Thousand Seven Hundred and Thirty-eight." "2. 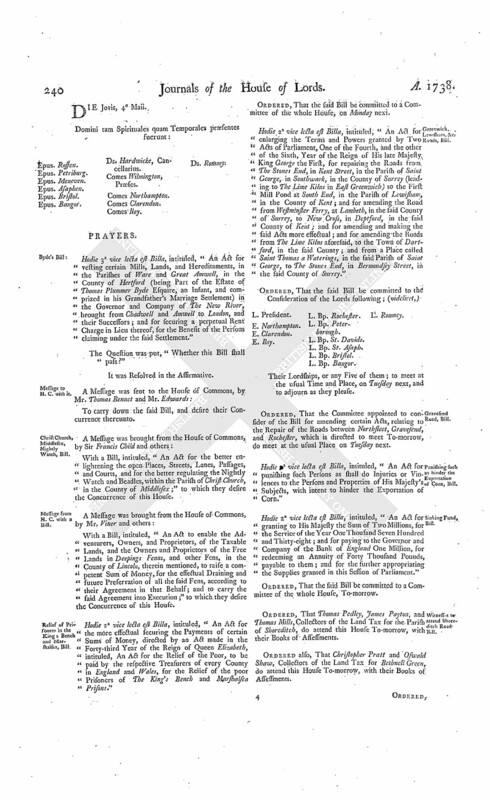 An Act for granting to His Majesty the Sum of Two Millions, for the Service of the Year One Thousand Seven Hundred and Thirty-eight; and for paying to the Governor and Company of the Bank of England One Million, for redeeming an Annuity of Forty Thousand Pounds payable to them; and for the further appropriating the Supplies granted in this Session of Parliament." "3. An Act to continue Two several Acts therein mentioned; one, for encouraging the Growth of Coffee in His Majesty's Plantations in America; and the other, for the better securing and encouraging the Trade of His Majesty's Sugar Colonies in America." "4. An Act to indemnify Persons who have omitted to qualify themselves for Offices, or to read the Prayers, and make the Declarations and Subscriptions required, within the respective Times limited by Law; and for allowing further Time for those Purposes." "5. An Act for Relief of such Prisoners for Debt, as have by unavoidable Accidents lost the Benefit of an Act, passed in the last Session of Parliament, intituled, "An Act for Relief of Insolvent Debtors;" and for the Indemnity of such Sheriffs and Gaolers as have incurred any Penalties on account of such Prisoners not being discharged; and for extending the Benefit of the said Act to Creditors, whose Debtors were committed to Prison since the First Day of January One Thousand Seven Hundred and Thirty, and were detained there upon the First Day of January One Thousand Seven Hundred and Thirty-six, and have chose to continue there." "6. An Act for continuing of an Act made in the Sixth Year of the Reign of His present Majesty, intituled, An Act for the better Regulation of Lastage and Ballastage in the River Thames." "7. An Act for building a Bridge cross the River Thames, from the Woolstaple, or thereabouts, in the Parish of Saint Margaret, in the City of Westminster, to the opposite Shore, in the County of Surrey." "8. An Act for the better regulating the Manufacture of Narrow Woollen Cloths, in the West Riding of the County of York." "9. An Act for the more effectual securing the Payments of certain Sums of Money, directed, by an Act made in the Forty-third Year of the Reign of Queen Elizabeth, intituled, "An Act for Relief of the Poor," to be paid by the respective Treasurers of every County in England and Wales, for the Relief of the poor Prisoners of The King's Bench and Marshalsea Prisons." "10. An Act for punishing such Persons as shall do Injuries and Violences to the Persons or Properties of His Majesty's Subjects, with Intent to hinder the Exportation of Corn." "11. An Act for enforcing the Execution of an Act, made in the Ninth Year of His present Majesty's Reign, intituled, An Act for laying a Duty upon the Retailers of Spirituous Liquors, and for licensing the Retailers thereof." "12. An Act for the more effectual securing the Payment of Rents, and preventing Frauds by Tenants." "13. An Act for explaining and amending an Act of the Eighth Year of His present Majesty's Reign, intituled, An Act for the Application of the Rents and Profits of the Estates forfeited by the Attainders of James late Earl of Derwentwater and Charles Radcliffe." "14. 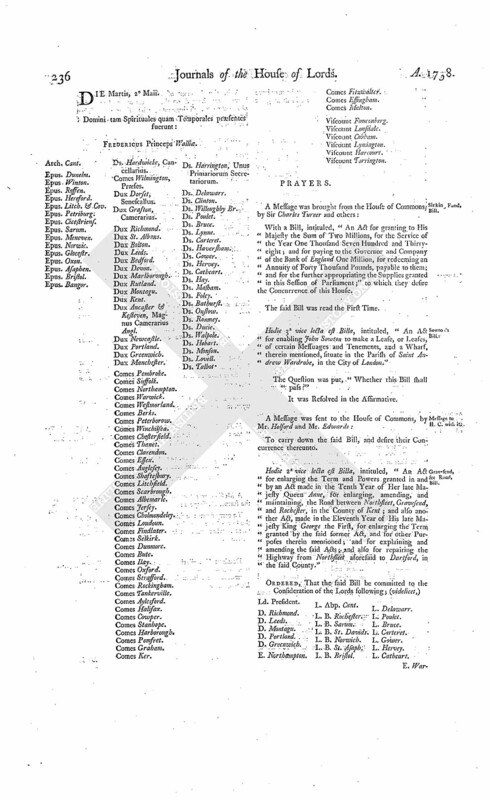 An Act to empower the Court of Lord Mayor and Aldermen of the City of London to set the Price upon all Coals, commonly called Sea Coals, imported into the Port of London, from Newcastle, and the Ports adjacent thereunto, for the Space of One Year; and to oblige, for the Term therein mentioned, Fitters and others vending and loading Ships with Sea Coals at Newcastle, and the Ports adjacent thereunto, to deliver such Coals to any Masters of Ships applying for the same; and for further obliging Buyers and Sellers of Sea Coals at Billingsgate, or other Place of Sale within the Bills of Mortality, to sign their Contracts for Coals; and for the Admeasurement of all Carriages wharsoever, used in loading Ships with Coals in the Port of Newcastle, and Members thereunto belonging." "15. An Act for allowing further Time for Enrolment of Deeds and Wills made by Papists; and for Relief of Protestant Purchasers, Devisees, and Lessees." "16. 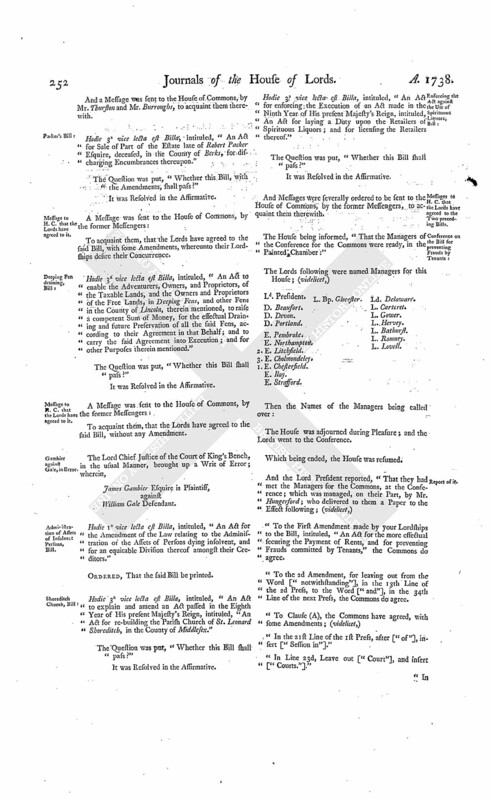 An Act for securing the Estates of Papists, conforming to the Protestant Religion, against the Disabilities created by several Acts of Parliament relating to Papists; and for rendering more effectual the several Acts of Parliament made for vesting in the Two Universities, in that Part of Great Britain called England, the Presentations of Benefices belonging to Papists." "17. An Act to amend an Act passed in the Twelfth and Thirteenth Year of the Reign of King William the Third, intituled, An Act for preventing any Inconveniences that may happen by Privilege of Parliament." "18. An Act for continuing the Term and Powers granted and given by the Acts passed in the Eleventh and Twelfth Year of the Reign of King William the Third, and in the Ninth and Tenth Years of the Reign of His late Majesty King George, for repairing the Harbour of Dover, in the County of Kent; and for restoring the Harbour of Rye, in the County of Sussex, to its ancient Goodness." "19. An Act for continuing the Terms and Powers granted and given by the Acts passed in the Twelfth and Thirteenth Year of the Reign of His late Majesty King William, and the Tenth Year of Her late Majesty Queen Anne, for recovering, securing, and keeping in Repair, the Harbour of Minehead, in the County of Somerset." "20. An Act for enlarging the Time granted by an Act passed in the Third Year of the Reign of His late Majesty King George, intituled, An Act for enlarging the Time granted by an Act passed in the Eighth Year of the Reign of Her late Majesty Queen Anne, intituled, An Act for making a convenient Dock, or Bason, at Liverpoole, for the Security of all Ships trading to and from the said Port of Liverpoole; and for enlarging the same, by making an additional Dock, and building a Pier in the open Harbour there; and for enlightening the said Dock." "21. 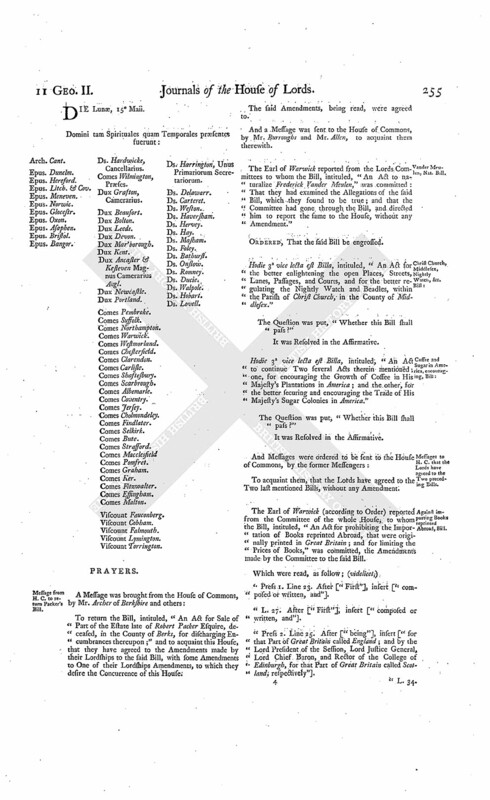 An Act for enlarging the Term and Powers granted by Two Acts of Parliament, One of the Third, and the other of the Tenth, Year of the Reign of His late Majesty King George the First, for repairing the Highways from that Part of Counters Bridge which lies in the Parish of Kensington, in the County of Middlesex (leading through the Towns of Brentford and Hounslow), to the Powder Mills, in the Road to Staines, and to Cranford Bridge, in the said County, in the Road to Colnbrooke." "22. An Act for enlarging the Term and Powers granted and given by an Act passed in the Twelfth Year of the Reign of His late Majesty King George, for repairing the Road from Lemsford Mill, in the County of Hertford, to Welwyn, and from thence to Gory's Mill, and from Welwyn (through Codicot) to Hitchin, in the said County; and also for repairing the Roads from Cory's Mill to Hitchin aforesaid." "23. An Act for repairing the Roads from the Town of Loughborough, in the County of Leicester, to the Town of Derby, in the County of Derby; and from the said Town of Derby, to the Town of Brassington, in the said County of Derby; and from the said Town of Derby, through the Town of Ashborne, in the said County of Derby, to Hurdloe House, in the Parish of Hartingdon, in the said County." "24. 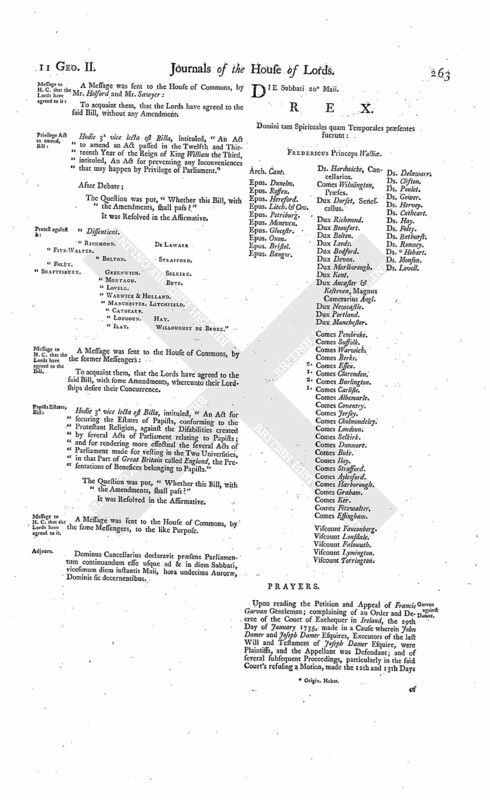 An Act for enlarging the Term and Powers granted by Two Acts of Parliament, one of the Fourth, and the other of the Sixth, Year of the Reign of His late Majesty King George the First, for repairing the Roads from The Stones End, in Kent Street, in the Parish of St. George, in Southwark, in the County of Surrey (leading to The Lime Kilns in East Greenwich) to the First Mill Pond at South End, in the Parish of Lewisham, in the County of Kent; and for amending the Road from Westminster Ferry, at Lambeth, in the said County of Surrey, to New Cross, in Deptford, in the said County of Kent; and for amending and making the said Acts more effectual; and for amending the Roads from The Lime Kilns aforesaid, to the Town of Dartford, in the said County; and from a Place called Saint Thomas a Waterings, in the said Parish of Saint George, to The Stones End, in Bermondsey-street, in the said County of Surrey." "25. An Act for enlarging the Term and Powers granted in and by an Act, made in the Tenth Year of Her late Majesty Queen Anne, for enlarging, amending, and maintaining, the Road between Northfleet, Gravesend, and Rochester, in the County of Kent; and also another Act, made in the Eleventh Year of His late Majesty King George the First, for enlarging the Term granted by the said former Act; and for other Purposes therein mentioned; and for explaining and amending the said Acts; and also for repairing the Highway from Northfleet aforesaid to Dartford, in the said County." "26. An Act for repairing the Road from Shoreditch Church, through Hackney, to Stanford Hill, and cross Cambridge Heath, over Bethnall Green, to the Turnpike at Mile End, in the County of Middlesex." "27. An Act for the more effectual Draining and Preservation of certain Fens, called Cawdle Fen, Waterden, and Redmore, and One Piece of Fen Ground, called The Holts, in the Isle of Ely, in the County of Cambridge." "28. An Act to enable the Adventurers, Owners, and Proprietors, of the Taxable Lands, and the Owners and Proprietors of the Free Lands, in Deeping Fens, and other Fens, in the County of Lincoln, therein mentioned, to raise a competent Sum of Money, for the effectual Draining and future Preservation of all the said Fens, according to their Agreement in that Behalf, and to carry the said Agreement into Execution; and for other Purposes therein mentioned." "29. An Act for taking down and re-building the Church of the Parish of All Saints, in the City of Worcester." "30. 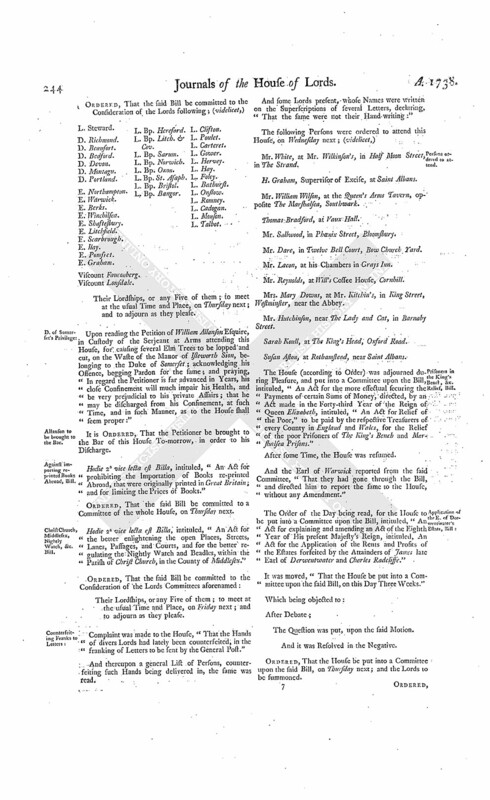 An Act to enlarge the Term and Powers granted by an Act of Parliament made and passed in the Third Year of the Reign of His late Majesty King George, intituled, An Act to enable the Parishioners of the Parish of Saint Mary, Rotherith, in the County of Surrey, by certain Funeral Rates therein mentioned, to finish the said Parish Church; and to enable the said Parishioners to raise such further Sums of Money as shall be necessary for purchasing a convenient Piece of Ground, for an additional Burial Ground; and for other Purposes therein mentioned." "31. An Act to explain and amend an Act passed in the Eighth Year of His present Majesty's Reign, intituled, An Act for re-building the Parish Church of Saint Leonard Shoreditch, in the County of Middlesex." "32. An Act to empower the present Trustees under the last Will and Testament of John Marshall Gentleman, deceased, to lay out a certain Sum of Money now in their Hands, for pulling down and re-building the Parish Church of Christ Church, in the County of Surrey; and for enclosing a Piece of Ground, lately purchased, for an additional Church Yard to the said Church." "33. An Act for the better enlightening the open Places, Streets, Lanes, Passages, and Courts, and for the better regulating the Nightly Watch and Beadles, within the Parish of Christ Church, in the County of Middlesex." "34. An Act for vesting the Real and Personal Estate of Hugh Naish Esquire (who was late a Prisoner in His Majesty's Prison of The Fleet, and escaped out of the same) in Trustees, for the Benefit of his Creditors." "35. An Act for continuing the Duty of Two Pennies Scots, or One Sixth Part of a Penny Sterling, on each Pint of Ale and Beer that shall be vended or sold within the Town of Inverness and Privileges thereof, for paying the Debts of the said Town; and other Purposes therein mentioned." "36. An Act for vesting the Manor of Goldborn, Part of the settled Estate of William Duke of Devonshire, in the County of Lancaster, in the said Duke and his Heirs; and for settling the Manor of Black Wall, in the County of Derby, in Lieu thereof, to the like Uses." "37. An Act for vesting divers Lands and Hereditaments, in the Counties of Kent, Suffolk, Essex, Hereford, and Monmouth, and the City of London, entailed by the Will of Elizabeth late Dutchess of Bedford, in John Duke of Bedford, in Fee Simple; and for settling other Estates, in the Counties of Bucks and Hertford, of greater Value, to the like Uses, in Lieu thereof." "38. An Act for vesting certain Lands and Hereditaments in the Kingdom of Ireland, Part of the settled Estate of Richard Earl of Burlington and Corke, in Trustees, to be sold, for Payment of Debts; and for settling other Lands and Hereditaments, of greater Value, to the same Uses." "39. 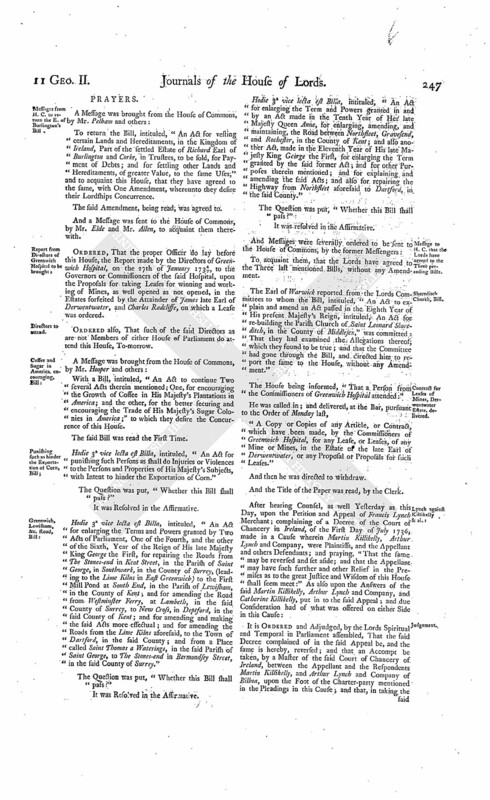 An Act for explaining and amending a certain Trust and Power contained in the Settlement made on the Marriage of Richard Lord Viscount Molyneux, of the Kingdom of Ireland, with Mary Lady Molyneux, his now Wife, for raising Portions for the Daughters of the said Marriage; and for the better ascertaining and more effectually securing the said Portions." "40. An Act to dissolve the Marriage of Sir William Morice Baronet with Lady Lucy Wharton; and to enable him to marry again; and for other Purposes therein mentioned." "41. An Act to enable Sir Brian Broughton Baronet, an Infant, to enter into Marriage Articles, notwithstanding his Infancy." "42. An Act for exchanging Part of the Glebe Lands and Hereditaments belonging to the Rector of Stratford Toney, in the County of Wilts, for other Lands belonging to the Lord of the Manor." "43. An Act to enable Trustees to grant Building Leases of certain Messuages, in the Parishes of Saint Martin in the Fields and Saint Clement Danes, in the County of Middlesex, late the Estate of Henry May Esquire, deceased." "44. An Act for confirming the Sale of the Leasehold Estate late of Barnaby Coles, Gentleman, deceased; and for vesting his Freehold Estates in Trustees, to be sold, for Payment of his Debts." "45. An Act to enable the Guardian of Amy Symes and Catherine Symes, Infants, to join in making Leases of Lands, in the Counties of Somerset and Devon, with the other Owners thereof, during the Minority of the said Infants." "46. An Act for confirming and establishing an Agreement between William Studholm Gentleman and Cuthbert Hodgson Gentleman, in relation to the Will and Estate of Michael Studholm Esquire, deceased." "47. An Act for Sale of Part of the Estate late of Robert Packer Esquire, deceased, in the County of Berks, for discharging Encumbrances thereupon." "48. An Act for vesting certain Mills, Lands, and Hereditaments, in the Parishes of Ware and Great Amwell, in the County of Hertford (being Part of the Estate of Thomas Plummer Byde Esquire, an Infant, and comprized in his Grandfather's Marriage Settlement) in the Governor and Company of The New River, brought from Chadwell and Amwell to London, and their Successors; and for securing a perpetual Rent Charge in Lieu thereof, for the Benefit of the Persons claiming under the said Settlement." "49. An Act for enabling John Sowton to make a Lease or Leases of certain Messuages and Tenements, and a Wharf, therein mentioned, situate in the Parish of St. Andrew Wardrobe, in the City of London." "50. An Act to enable Dorothea Clerk to sell Lands in the County of Dumfries, for Payment of Debts charged thereupon; and to purchase other Lands, to be settled to the same Uses as the Estate to be sold, is settled." "51. An Act to enable John Nairne to sue, or maintain any Action or Suit, notwithstanding his Attainder; and to remove any Disability in him, by reason of his said Attainder, to take or inherit any Real or Personal Estate that may or shall hereafter descend or come to him." "52. An Act to enable William Douglas, Eldest lawful Son to Sir Robert Douglas of Glenbervie Baronet, to sue or maintain any Action or Suit, notwithstanding his Attainder, and to remove any Disability in him, by reason of his said Attainder, to take or inherit any Real or Personal Estate that may have descended or come to him since His late Majesty's most Gracious Pardon, dated the Sixth Day of February, in the Sixth Year of His Reign, or that shall hereafter descend or come to him." "53. An Act for reducing the Stint of the Horse or Beast Pastures, and Sheep Commons, within the Manor, Town, and Parish, of Castle Donnington, in the County of Leicester." "54. An Act for enclosing and dividing the Common Fields, Wastes, and Unenclosed Grounds, within the Manor, Township, or Hamlet, of Ashenden, in the County of Bucks; and for the making effectual certain Exchanges therein mentioned." "55. An Act for enclosing and dividing the Common Mead, or Moor, called Speen Mead, or Speen Moor, in the County of Berks." "56. An Act for enclosing and dividing the Common Fields and Common Grounds, in the Manor and Parish of Binbroke, in the County of Lincoln." "57. An Act to enable William Massingberd Esquire, heretofore called William Meux, and the Heirs Male of his Body, to take and use the Surname of Massingberd, pursuant to a Settlement made by Sir William Massingberd Baronet, deceased." "58. An Act to enable Thomas May Esquire and his Sons, and the Heirs Male of their Bodies, to take and use the Surname of Knight, pursuant to the Will of Elizabeth Knight, deceased." "59. An Act for naturalizing John Justin Bruningk, Peter Untzellman, Henry Klencke, and others." "60. An Act for naturalizing Philip Rigail." "61. An Act to naturalize Herman Bernard and John Bosquain." "62. An Act to naturalize Frederick Vander Meulen." "It is with great Satisfaction I observe that the Temper and Moderation which I recommended to you, at the Opening of this Session, have been so well preserved through the general Course of your Proceedings; and that, from a due Regard to Me and My Honour, you have avoided all unnecessary Occasions of Heats and Animosities, and made the Interest of your Country the principal Object of your Care and Consideration." "I return you My Thanks, for the Supplies which you have so chearfully and effectually raised, for the Service of the current Year. The Provision you have made, to answer all Emergencies which may become necessary in Vindication of the Honour and Interest of My Crown and People, is a great Proof of your Zeal and Concern for the Welfare and Prosperity of the Nation; and shall be employed by Me in such a Manner as may best conduce to those Ends and Purposes for which you have so readily consented to this extraordinary Expence. "Agreeably to what hath appeared to be the concurrent Opinion of both Houses of Parliament, I have given Orders to repeat in the strongest and most pressing Manner My Instances at the Court of Spain, for obtaining Satisfaction for the many Injuries and Losses sustained by My trading Subjects in America, as well as an effectual Security of their Rights for the future: And I hope, from the Justice and Equity of the Catholic King, to procure such Satisfaction and Security, as may preserve the Peace, and establish a free and uninterrupted Exercise of Navigation and Commerce, mutually, between the Subjects of both Crowns, pursuant to our Treaties, and the Law of Nations." "It is His Majesty's Royal Will and Pleasure, that this Parliament be prorogued to Thursday the Twentyseventh Day of July next, to be then here held: And this Parliament is accordingly prorogued to Thursday the Twenty-seventh Day of July next."